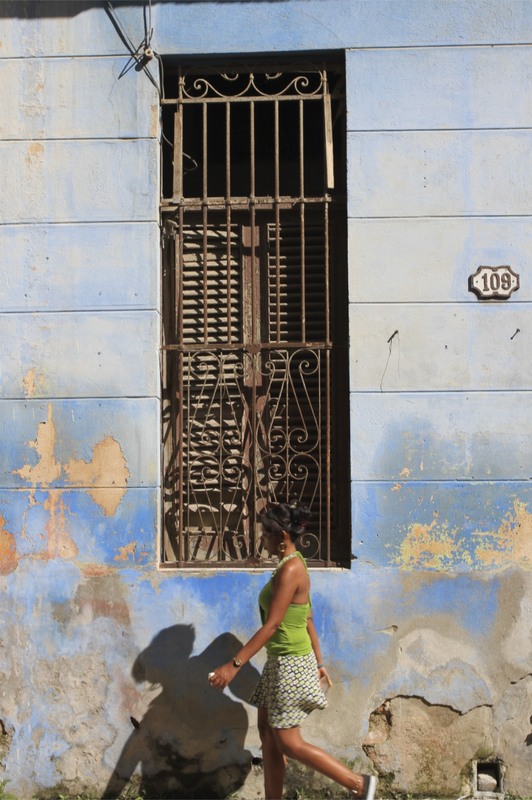 You could spend weeks in Havana and still not find the time to see or experience half of it. 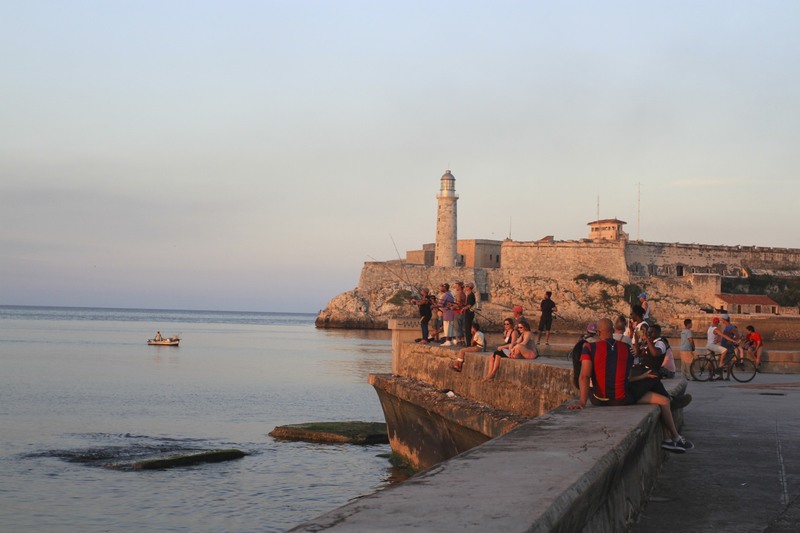 It’s easy to understand why people come to Cuba just to visit the city. It’s a place that imposes a lazy pace of life on you whether you like it or not. 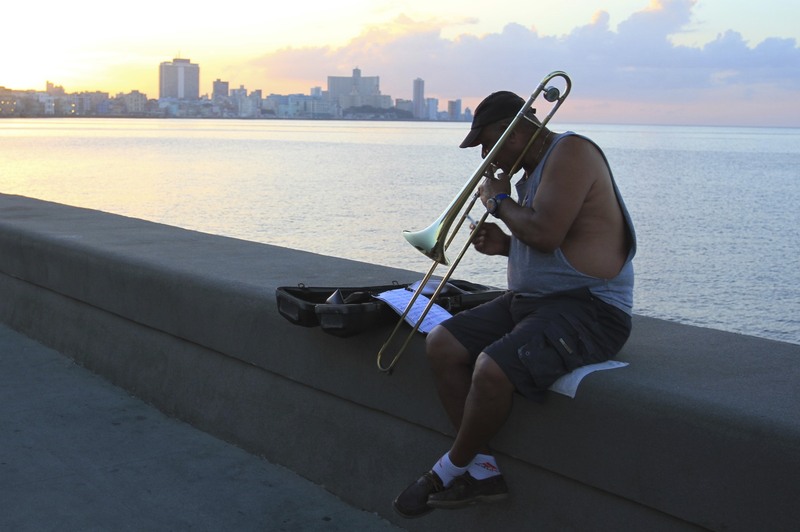 Best to embrace the rhythm of the city, have that 10am glass of rum with your casa owner and see where the day takes you. 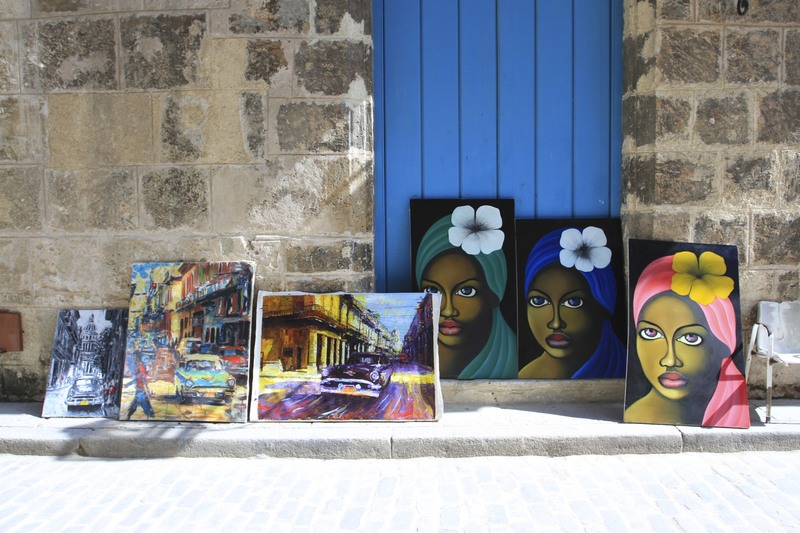 We had three days in Havana when we first arrived and quickly realised that we’d want to have more time in Cuba’s greatest city. 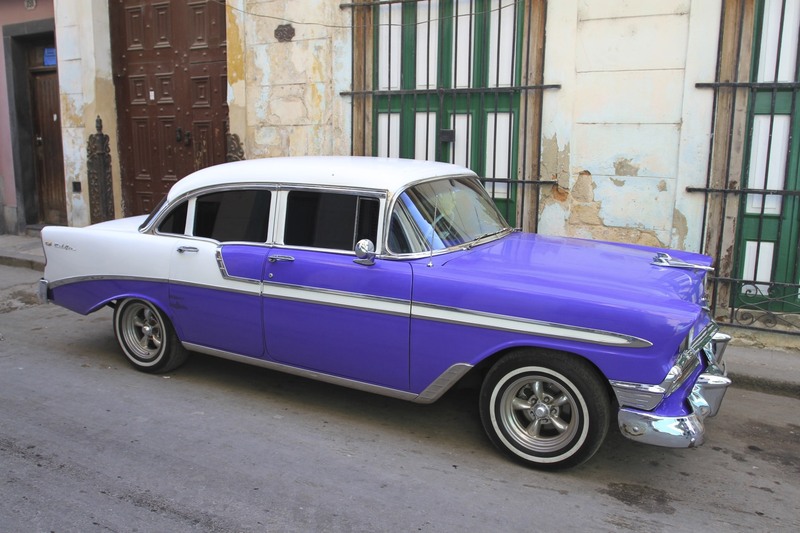 Coming back for another couple of days at the end of our trip a different Havana greeted us. 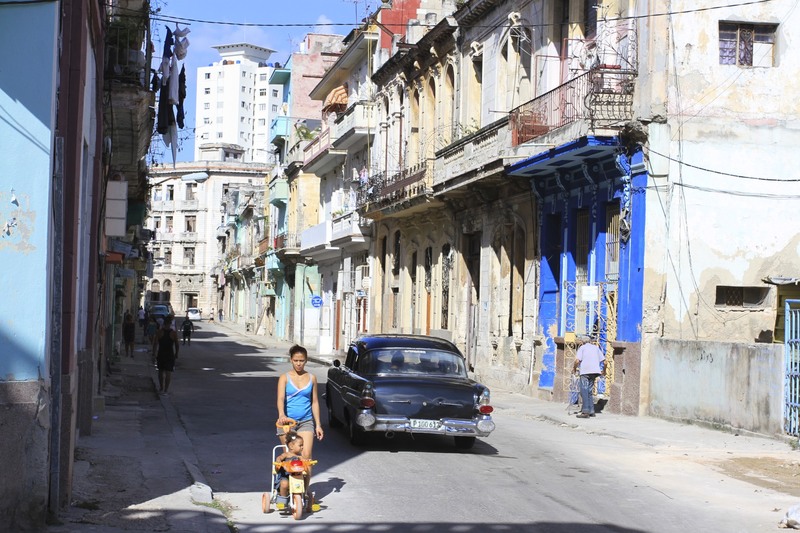 Thanks to its economic isolation, most of Cuba is very sleepy and Havana suddenly felt like a big, bustling city. 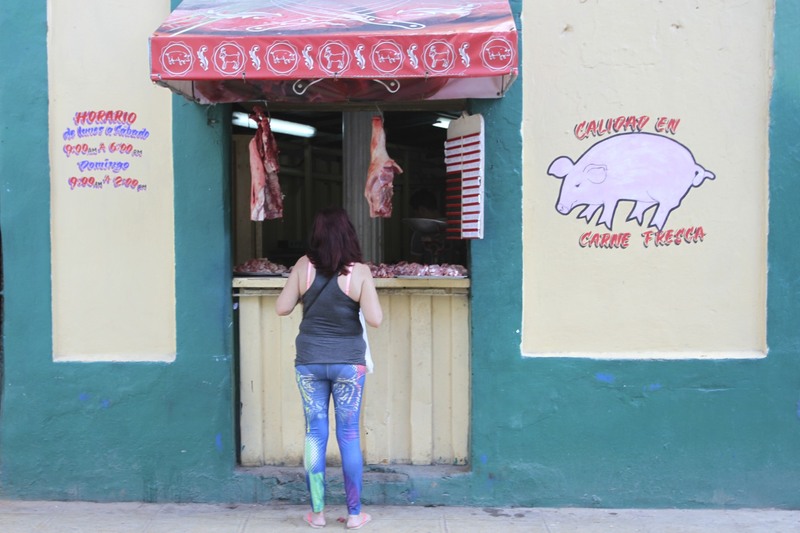 Most of our time in Havana was spent wandering the streets, popping into cafes and bars to cool down and listen to music, trying to get a feel for the city. 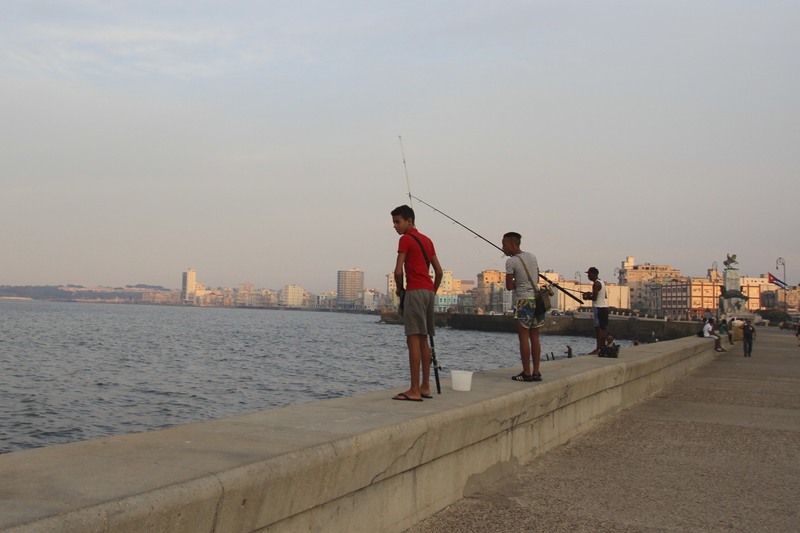 We were staying in a casa particular just behind the Malecon, Havana’s iconic waterfront, in the Havana Centro area of the city. A perfect location for exploration. 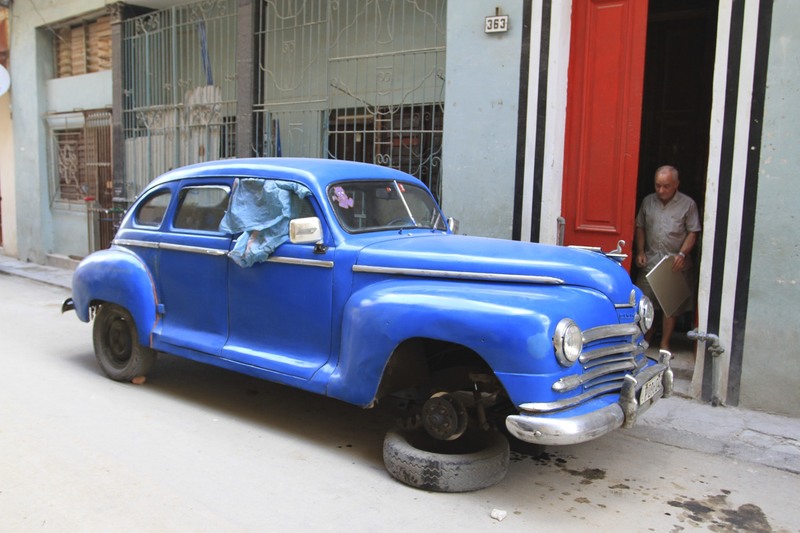 Havana Centro is yet to feel much benefit from the tourist boom or government investment. 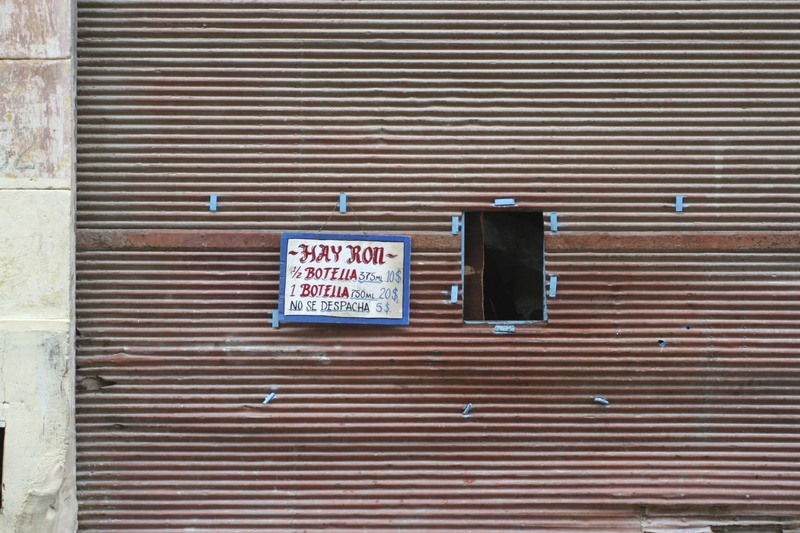 It’s a dilapidated area of crumbling buildings, piles of rubbish grace street corners and the smell of broken sewers fills the air. 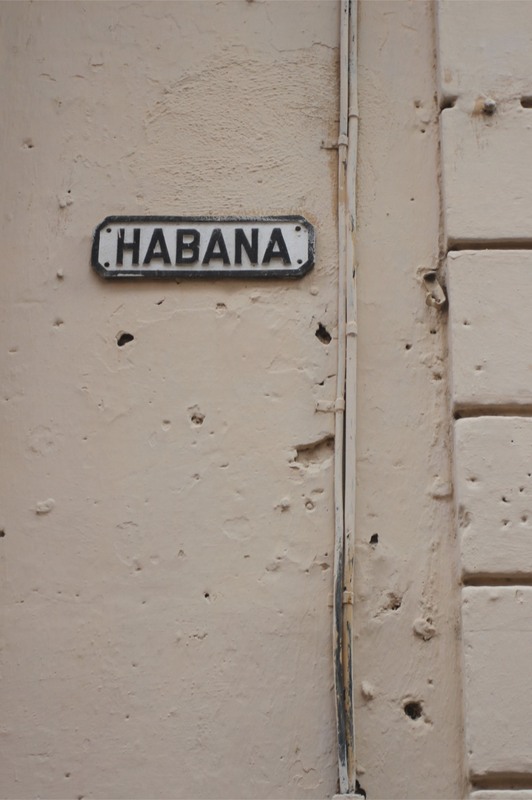 Yet it’s the most fascinating area of Havana we visited. The busy compact streets are full of life, day and night. 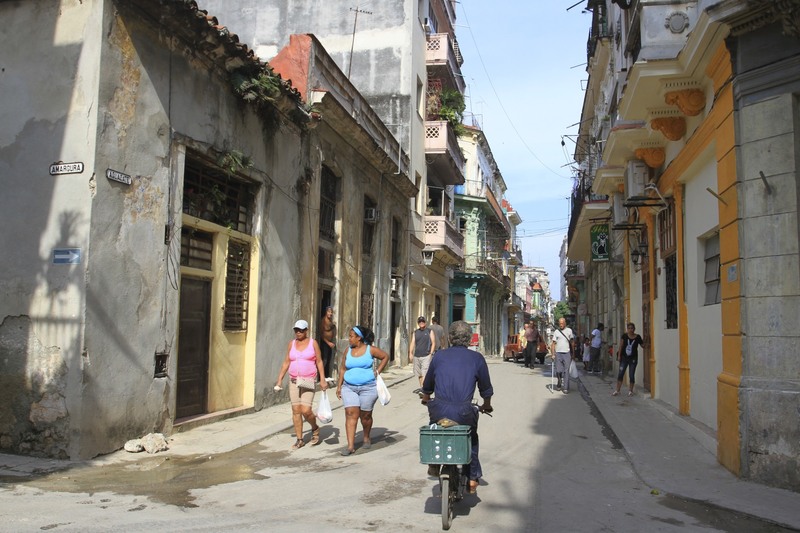 It’s a more authentic, less glamorous version of Havana Vieja. 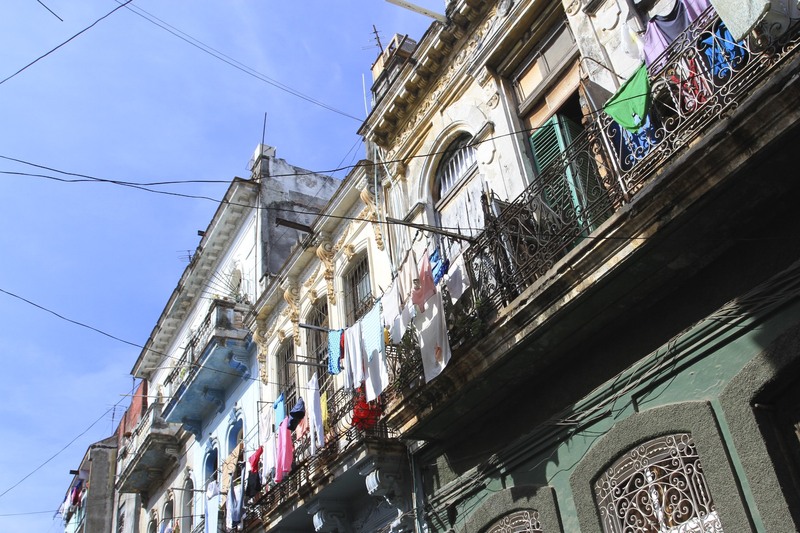 Built in the late 18th and early 19th Centuries to accommodate the city’s growing population, Havana Centro is separated from Havana Vieja by the glorious Prado, or the Paseo de Marti to give it its official name. 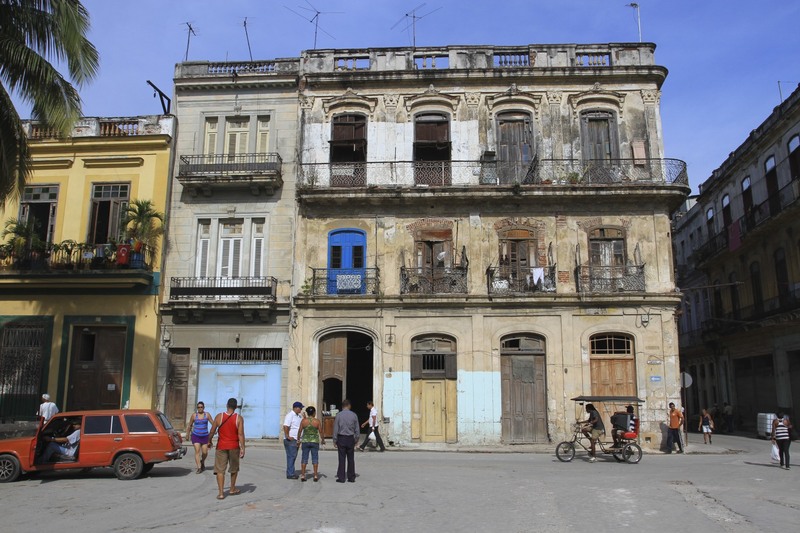 This was one of our favourite streets, home to ever-changing scenes of daily life overshadowed by beautiful buildings. 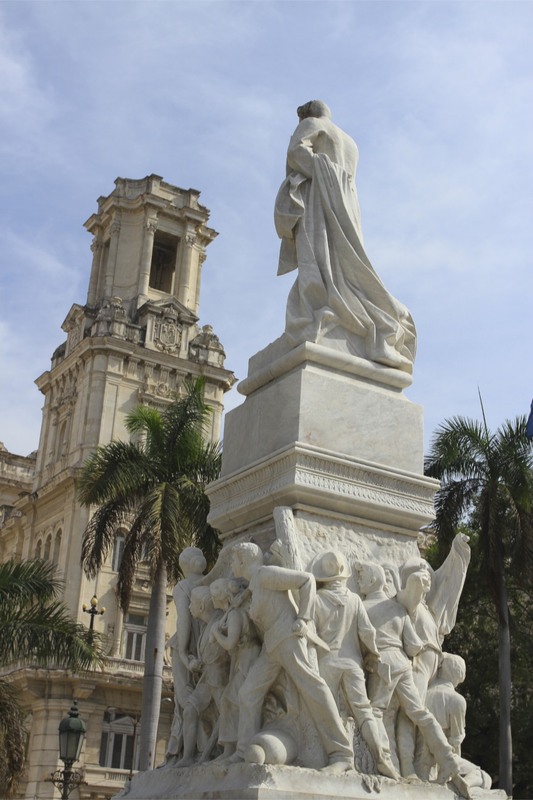 You can walk from the waterfront all the way up the Prado to the Capitolio Nacional. Styled on Washington DC’s Capitol, it was built slightly larger just to make a point. 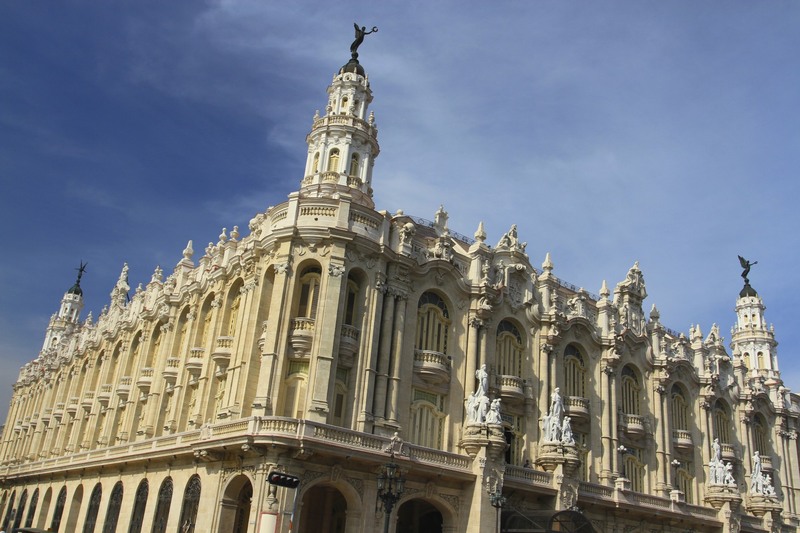 It sits next to the meringue-like Gran Teatro de Havana, and is close to Parque Central where a clutch of high-end hotels offer wifi, good drinks and live music. The terrace of the Hotel Inglaterra was the obvious choice for a piña colada and people-watching. 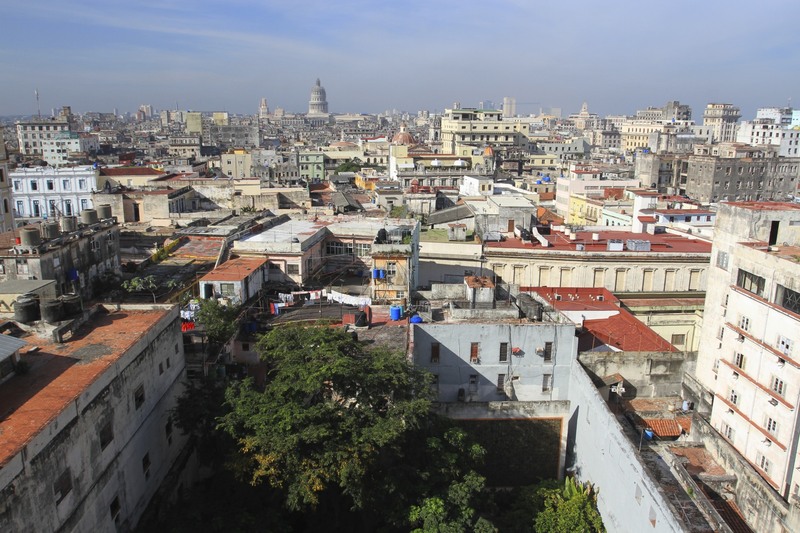 Behind the Capitol is a part of Havana Centro mostly ignored by foreigners. 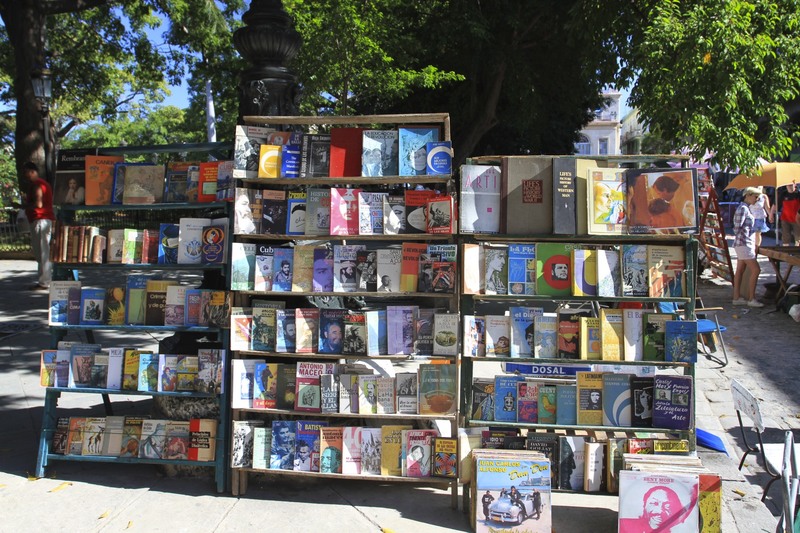 We strolled for hours, finally giving in to the heat and taking a bicycle taxi to the weirdly sterile Plaza de la Revolución. 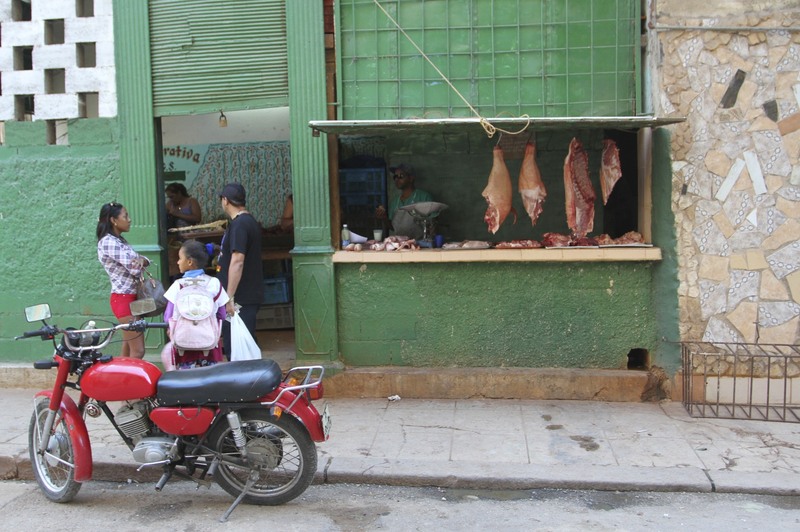 After the cramped streets of Havana Centro this vast open space feels like you’ve entered a different universe, almost like it doesn’t belong to Havana. 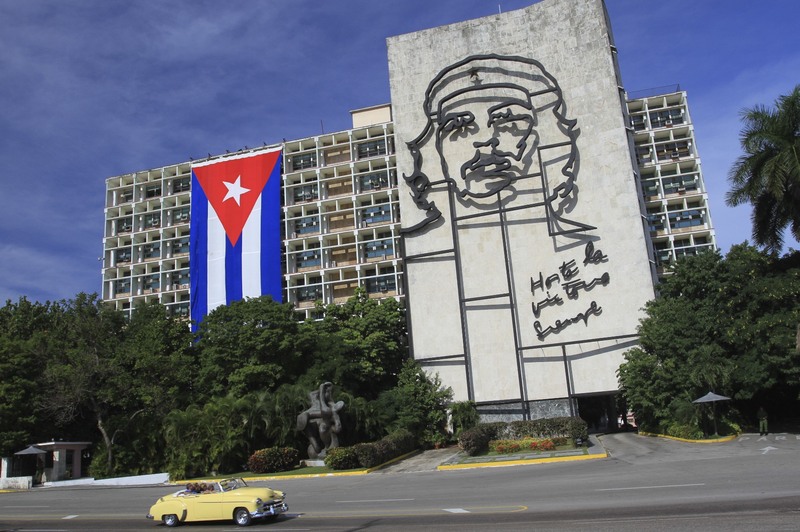 This is the seat of the Cuban Government and home to the Communist Party. 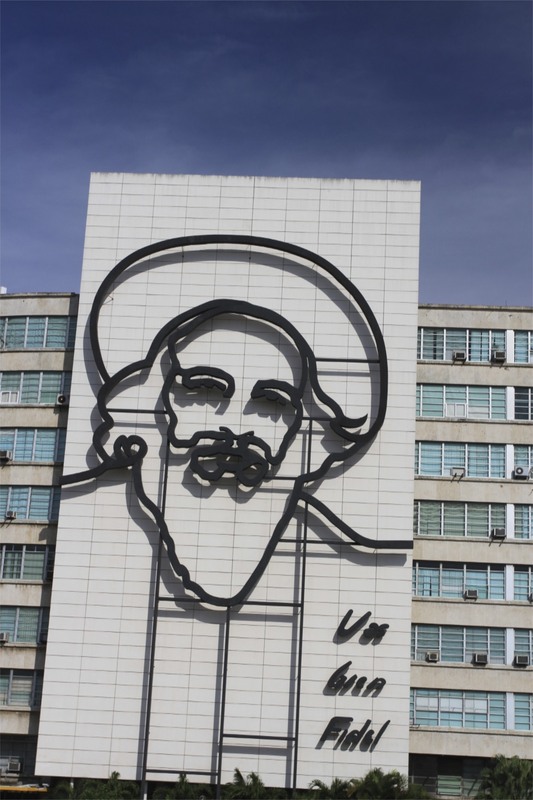 It’s also where Fidel Castro addressed up to a million people on important dates associated with the Revolution. 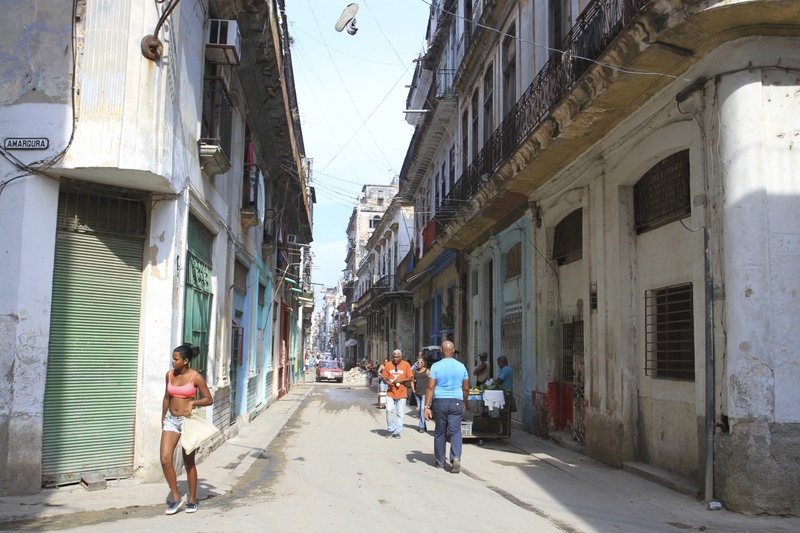 There isn’t a scrap of shade and Castro would bore the pants off people for hours on end. My idea of hell. More recently, Pope Francis addressed a huge crowd here. Also my idea of hell, but a sign of changing times. 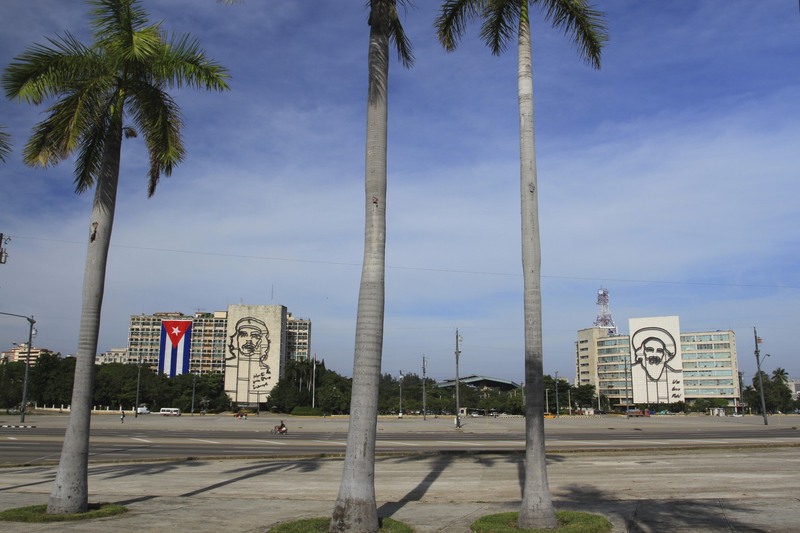 The Plaza de la Revolución is instantly recognisable by the large steel memorials to Che Guevara and Camilo Cienfuegos. 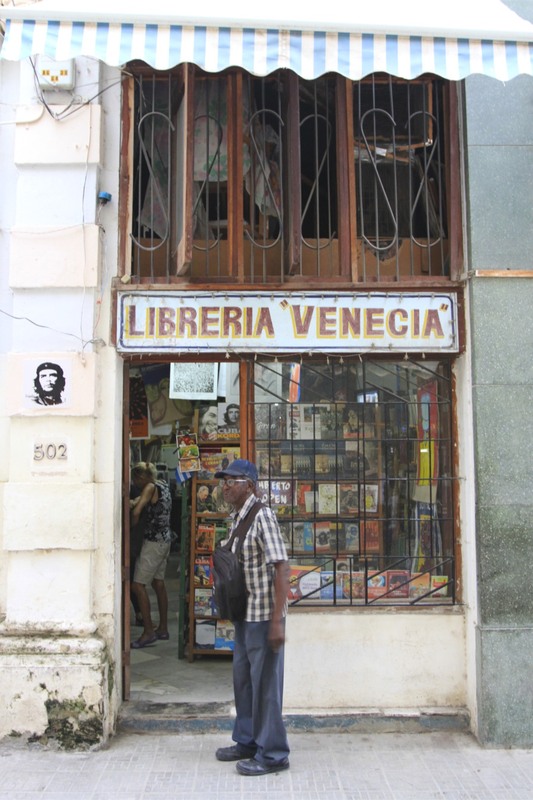 Cienfuegos, The Hero of Yaguajay, is less well-known than Che Guevara (have you ever seen a t-shirt with Cienfuegos on it? ), but he played a key role in defeating Batista’s government. He died in 1959 shortly after the triumph of the Revolution. The plaza is a sort of No Man’s Land dislocated from the rest of the city. 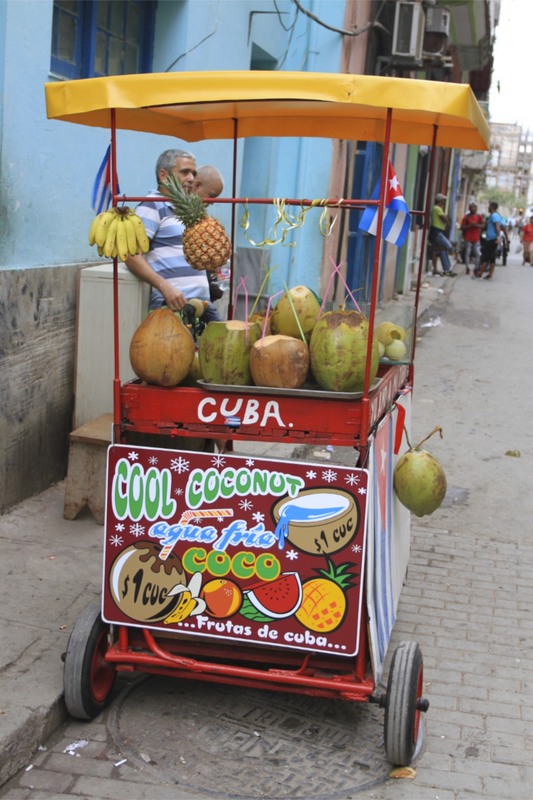 As we pondered our options a Coco Taxi pulled up, the urge to take a ride in Havana’s most absurd form of transport was irresistable. Coco Taxis have a less than enviable safety record, but they are a lot of fun. 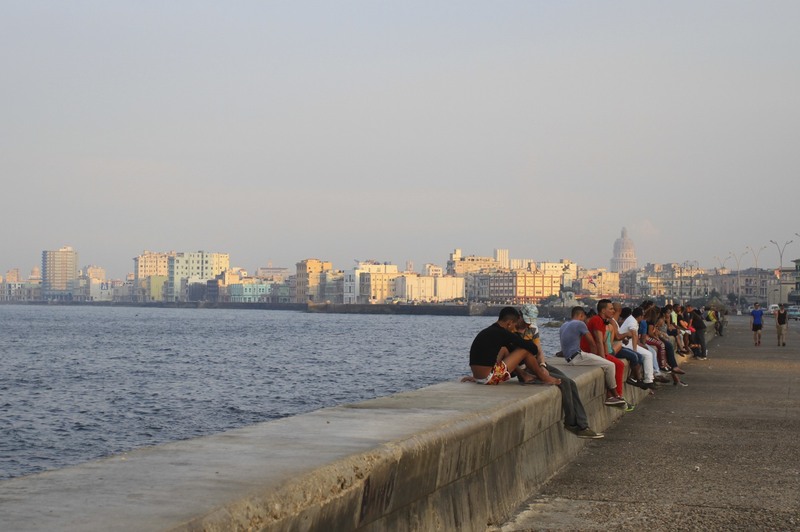 We whizzed down to the Malecon and then walked all the way back to Havana Centro as the sun set. 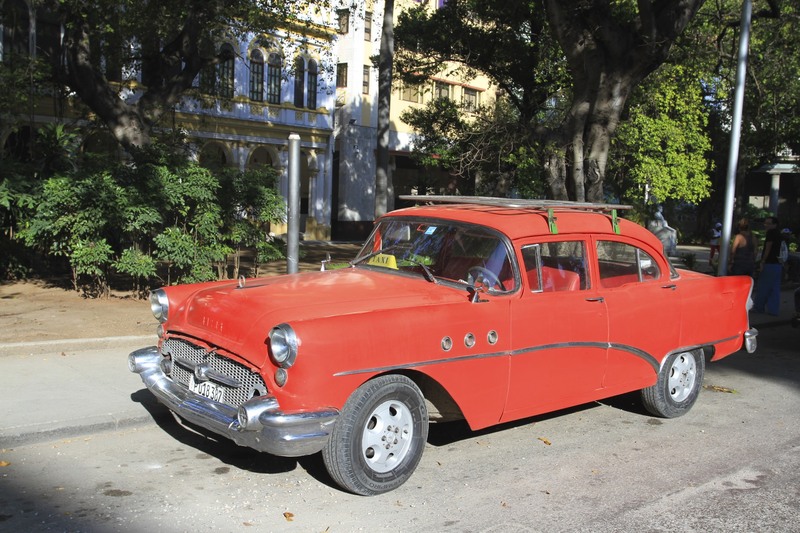 It was a fabulous ‘goodbye’ to Cuba. 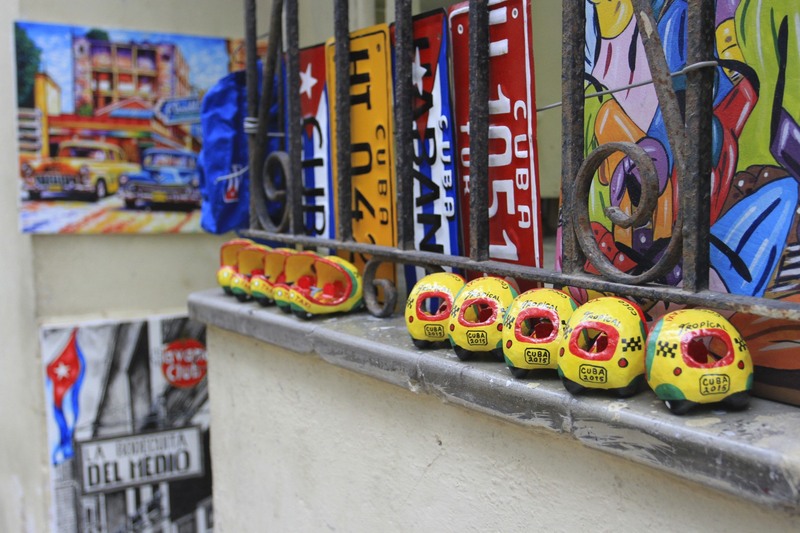 Traces of Spanish colonialism are easy to find scattered across the Caribbean and Latin America. 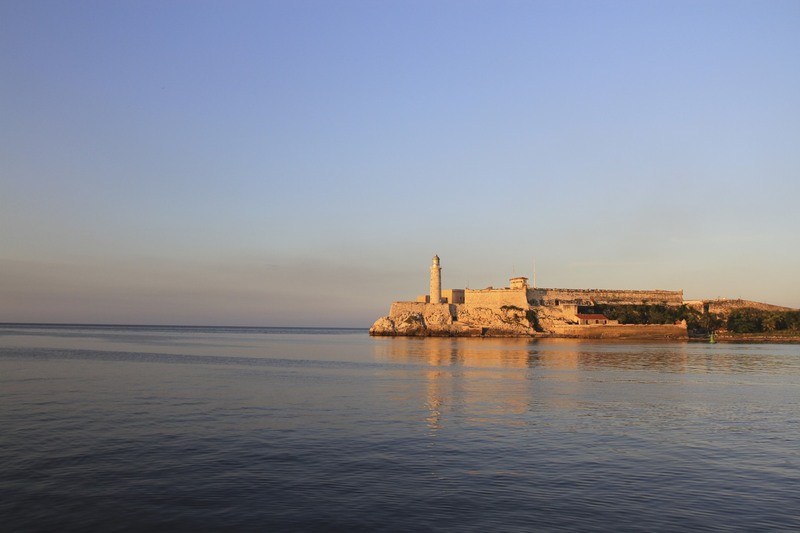 Some of the greatest cities of the New World were built to project the power of Spain: Panama Viejo, Cartagena, Lima, Buenos Aires and, perhaps most important of all, Havana Vieja. 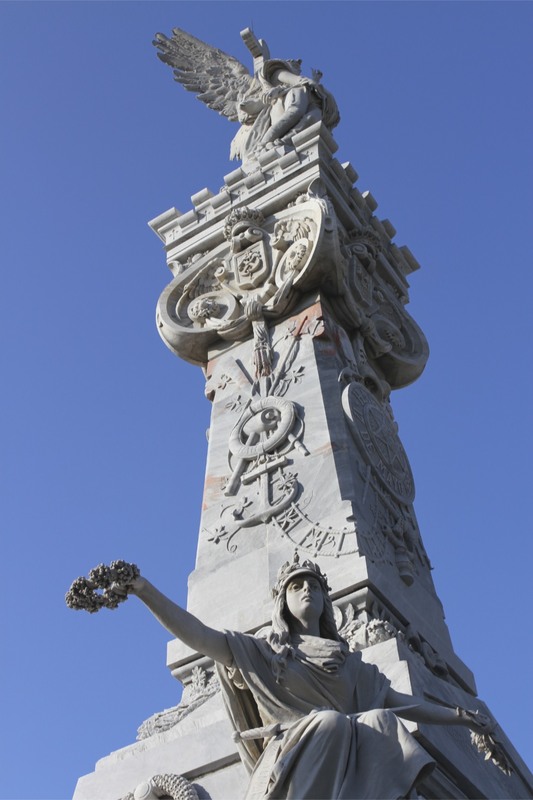 The wealth of these cities was coveted by many and jealously guarded by Spain. 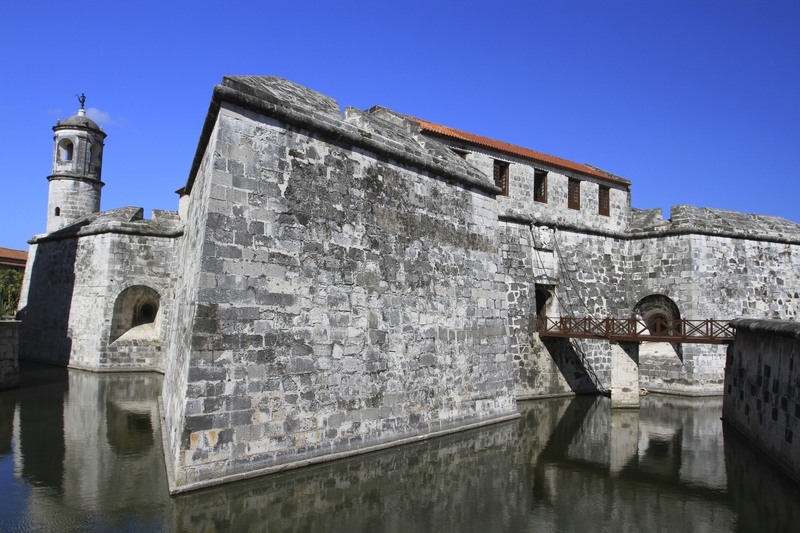 The massive complex of fortifications the Spanish built to protect Havana, first from pirates and later from competing European nations, is breathtaking in its scope and size. These are magnificent places, full of the history of a fascinating period. 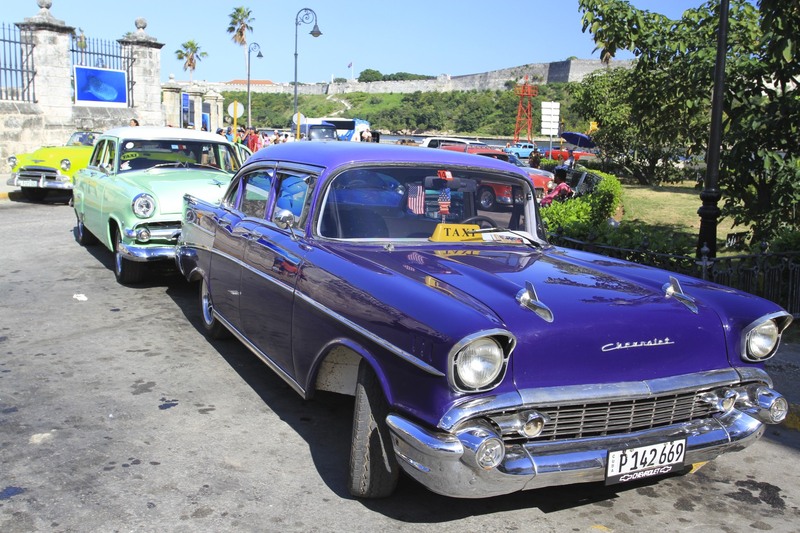 They’re also an indication of the value placed on Havana, where Spanish treasure ships congregated before risking the Atlantic crossing. 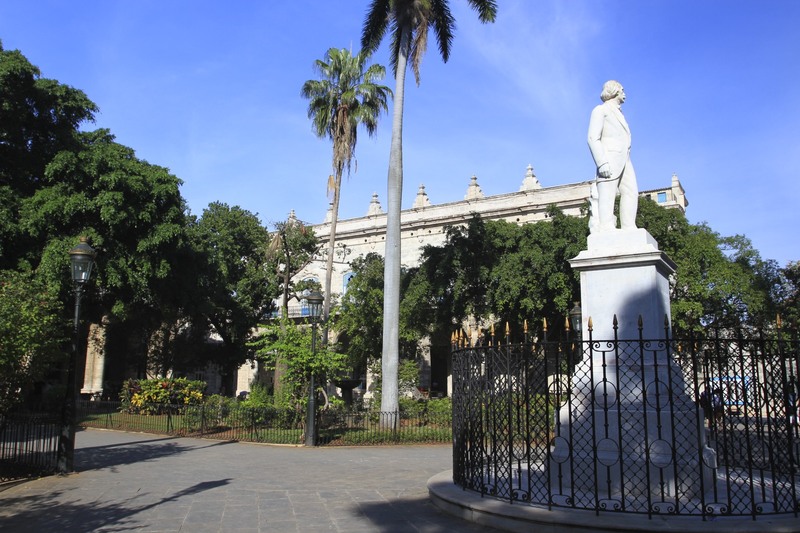 In Havana Vieja, sitting on one corner of the Plaza de Armas, the Castillo de la Real Fuerza feels like it’s part of the city. 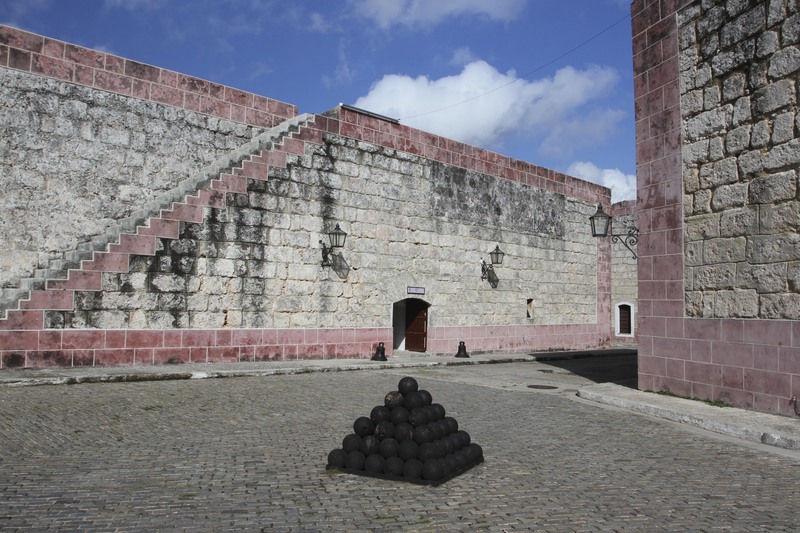 In reality, construction began in 1558, making it one of the oldest fortifications in the Americas. Surrounded by a moat it has impressive ‘spiked’ corners. 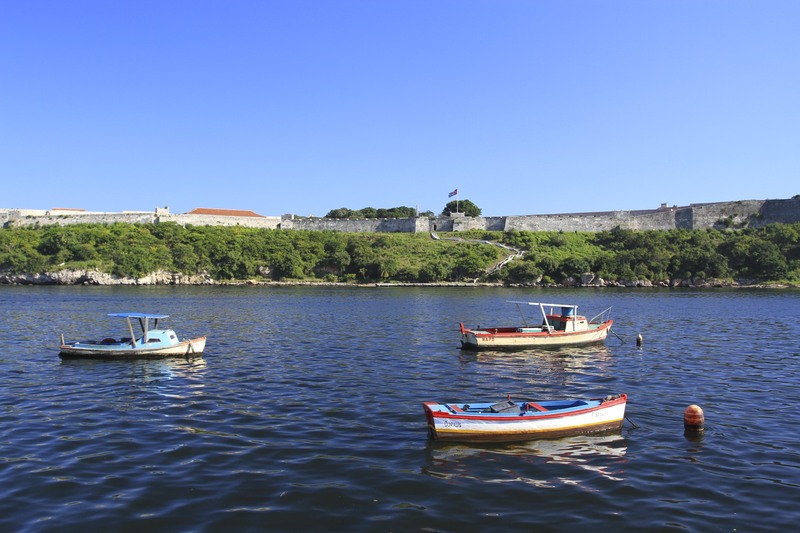 The Castillo de San Salvador de la Punta sits a short distance away on the western side of the harbour entrance, and was part of the defensive walls of the old city. 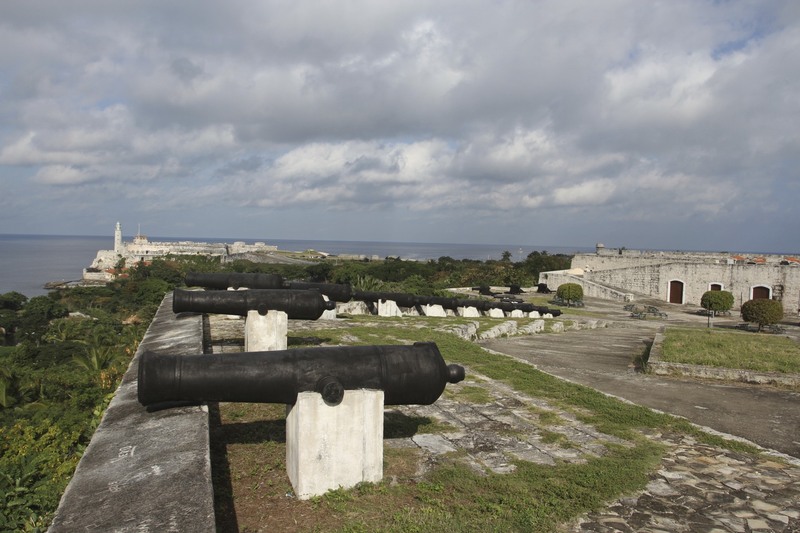 Today it plays host to a few cannons, and has views of fishermen trying to catch their supper in the aquamarine waters it guards. 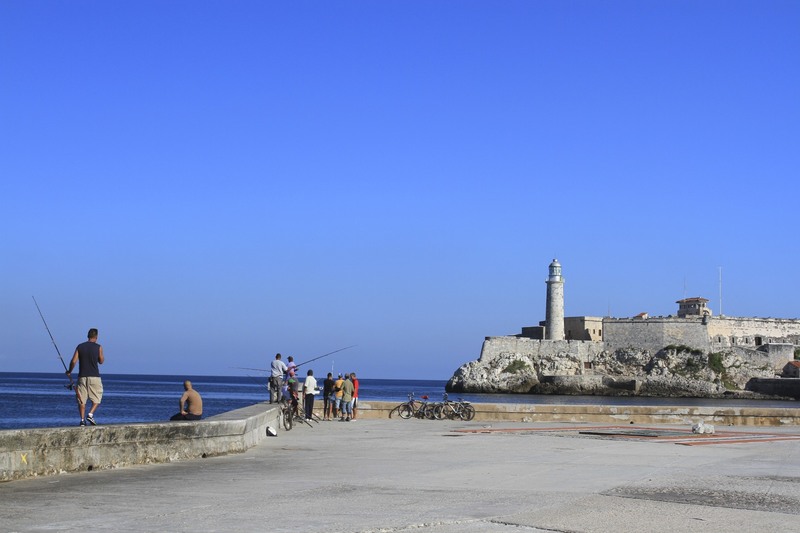 Opposite, on the eastern side of the harbour entrance, is the 18th Century Fortaleza de San Carlos de la Cabaña, one of the largest fortifications in the Americas (second only to Castillo San Felipe de Barajas in Cartagena). 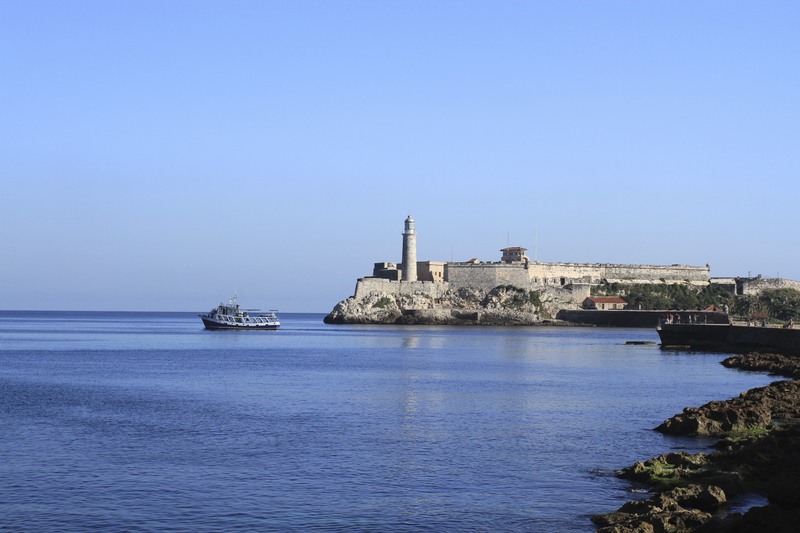 Nearby is the picturesque Castillo de los Tres Reyes del Morro, complete with lighthouse. Spain believed Castillo Morro to be impregnable, which proved too tempting for the British during the Seven Years’ War (1756 – 63) – a European war fought globally thanks to the expansion of European empires. The conflict raged across Europe, Canada, the United States, West Africa, India, the Philippines and the Caribbean. The Spanish allied themselves with France against Britain and Prussia, three of which had a powerful interest in attacking each others’ colonies. 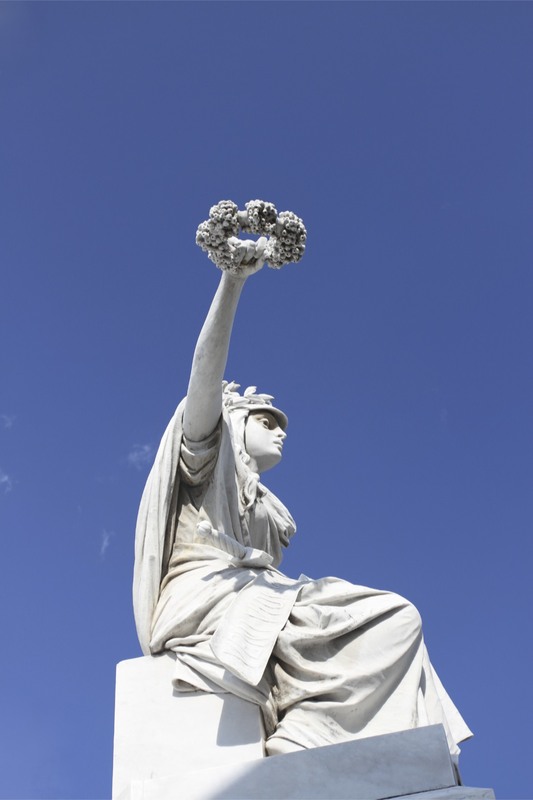 Spain’s Empire was plundered by the British in the Caribbean, while the French and British fought for control of North America, West African and India. 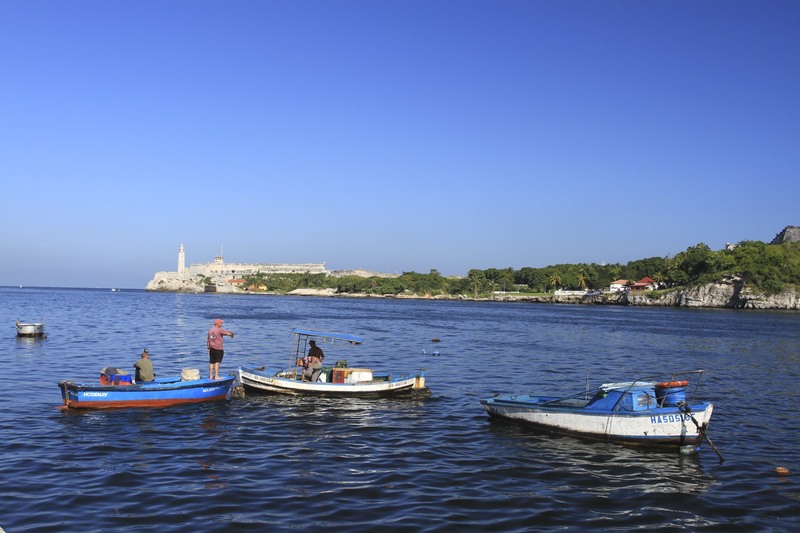 In 1762 a British fleet of fifty ships and twenty thousand men sailed into view off Havana. 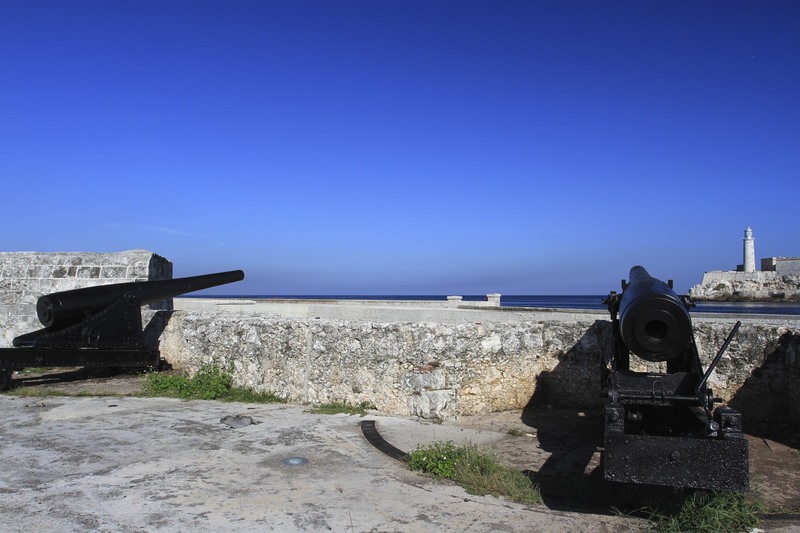 After a failed seaborne attack, the British took to land and marched on the rear of Castillo Morro. Setting up camp on high ground above the castle they spent the next forty-four days lobbing bombs at the Spanish. 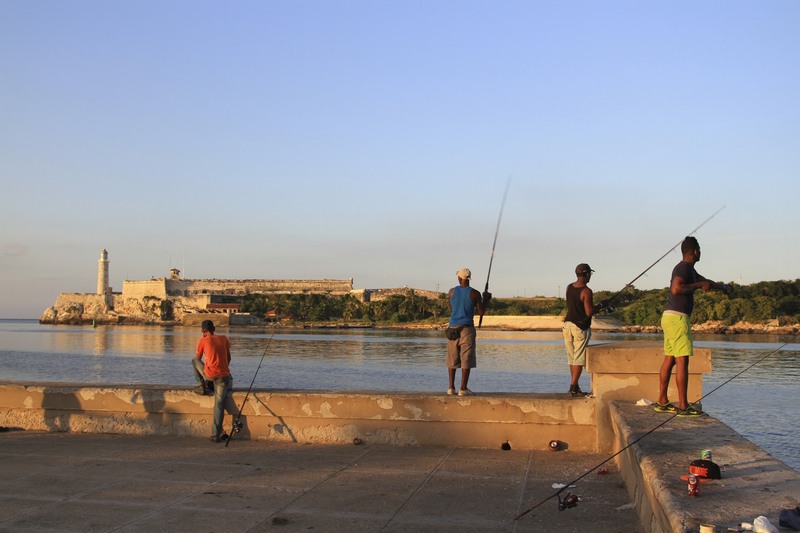 When the castle fell the British turned their attention to Havana. 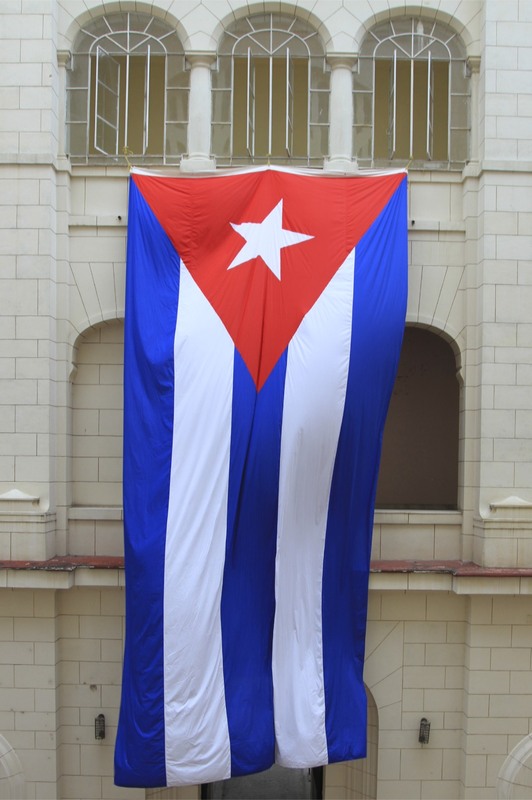 For nine months the British controlled Havana and Cuba. But the British, fresh from victory over France in Canada, preferred to protect their North American colonies than to keep Cuba. 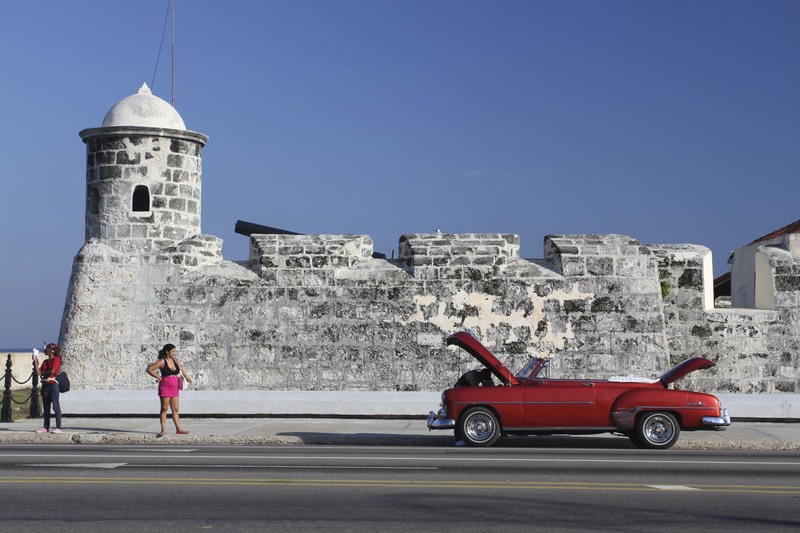 The end of the Seven Years’ War saw Britain swap Cuba for Florida. A Cleopatra’s Nose Theory if ever there was one. 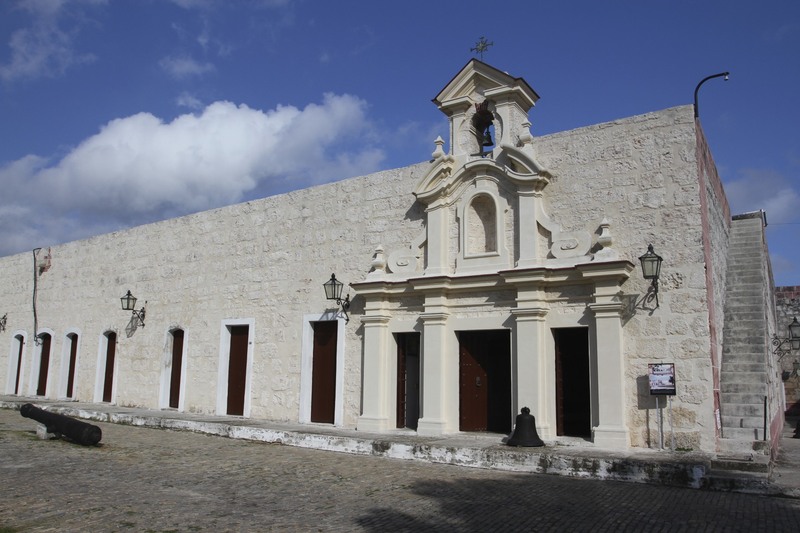 Dominating the skyline to the east, the Fortaleza de San Carlos de la Cabaña was constructed after the harsh lessons of the Seven Years’ War. 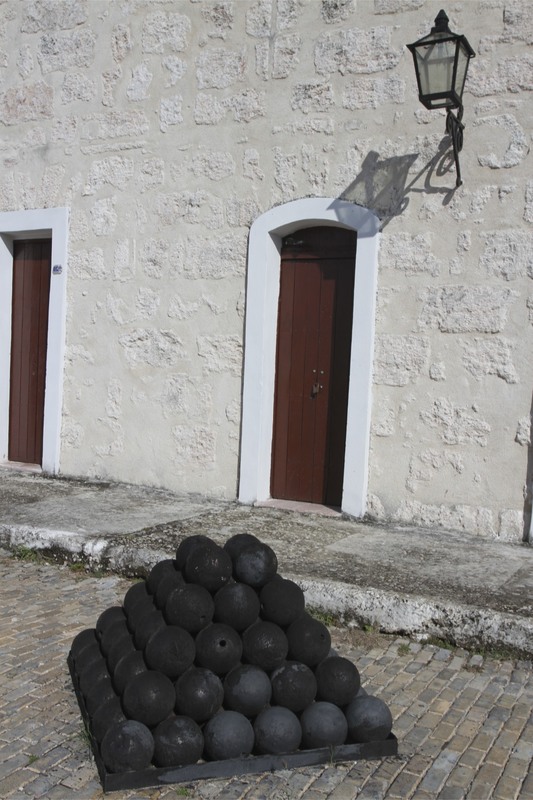 It’s full of magnificent old Spanish cannons, inscribed with royal insignia and the place and date of their forging. 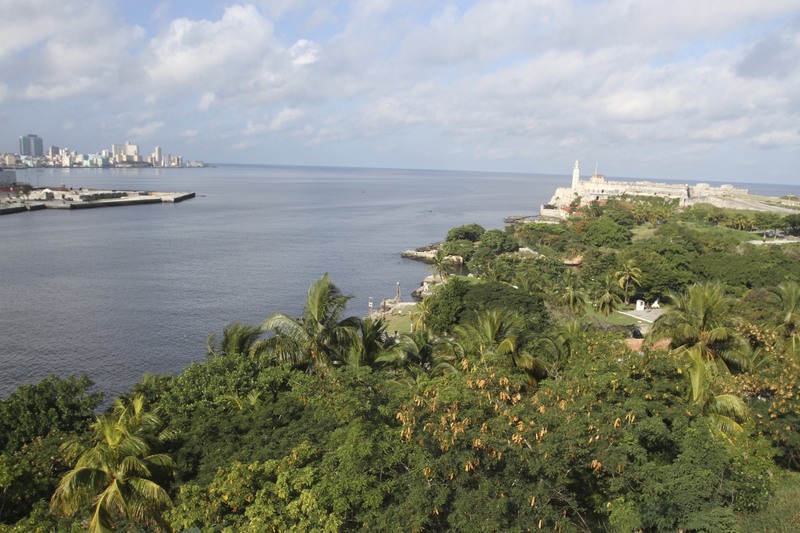 It has spectacular views over Havana. 700 metres long and 10 hectares in size, it was meant to deter all-comers. No one was foolhardy enough to attack it. 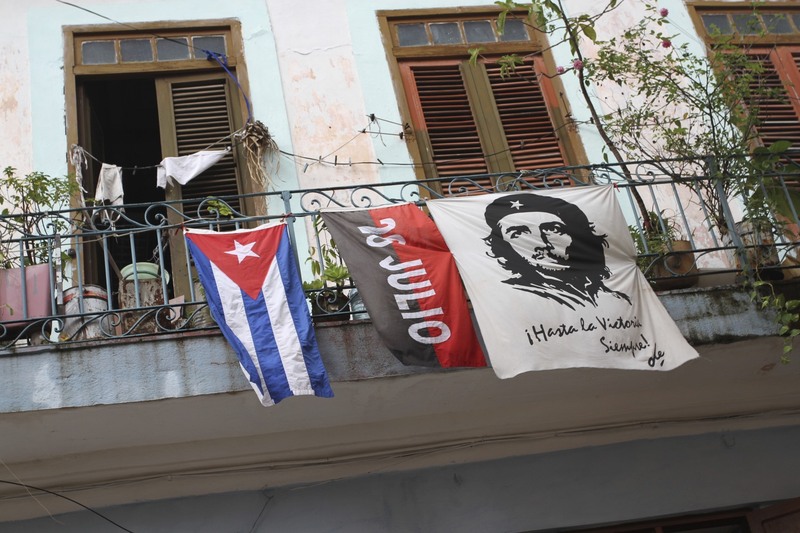 After the Cuban Revolution, Che Guevara set up his headquarters in the fort and here he summarily tried and executed opponents of the Revolution. When people fondly remember the romantic revolutionary, whose iconic image adorns millions of t-shirts, the extrajudicial killings for which he was responsible are mostly forgotten. Such is history. 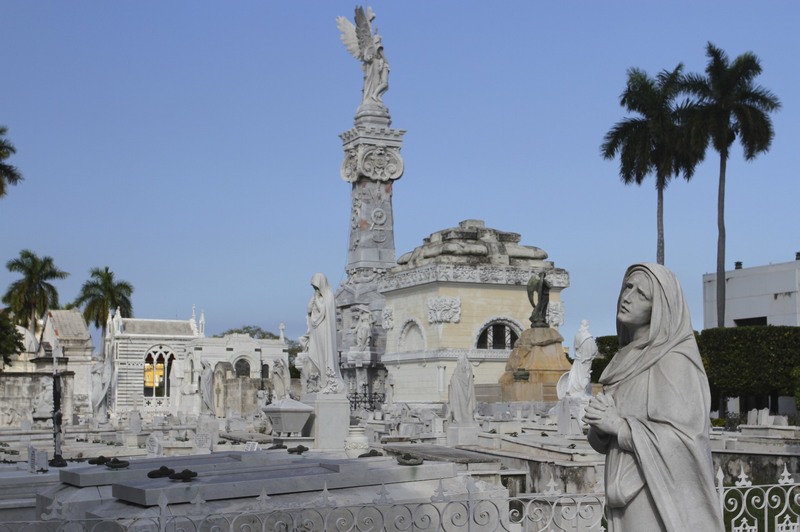 Havana’s Cementerio de Cristóbal Colón is so large there are cycling tours around it, a city within a city with streets signs to help you find your way. 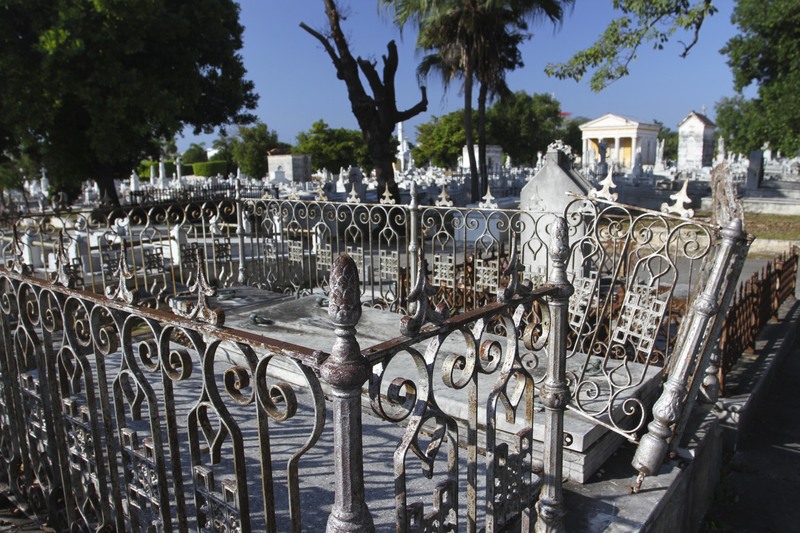 Its vast size is filled with beautiful chapels, mausoleums and graves that, architecturally, are on a par with La Recoleta in Buenos Aires. Which really is saying something. 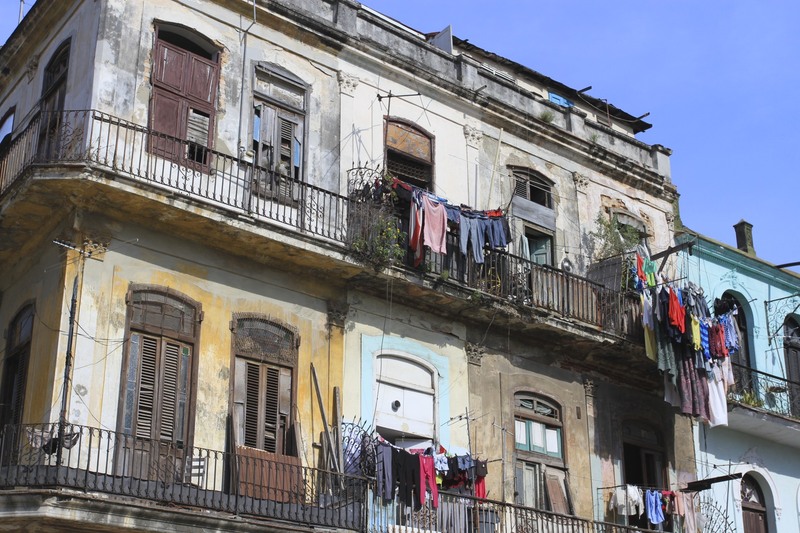 Given that it’s home to dead people – as many as 2.5 million dead people in its 140 year history – its remarkably well maintained compared to the rest of Havana, where actual living people live. 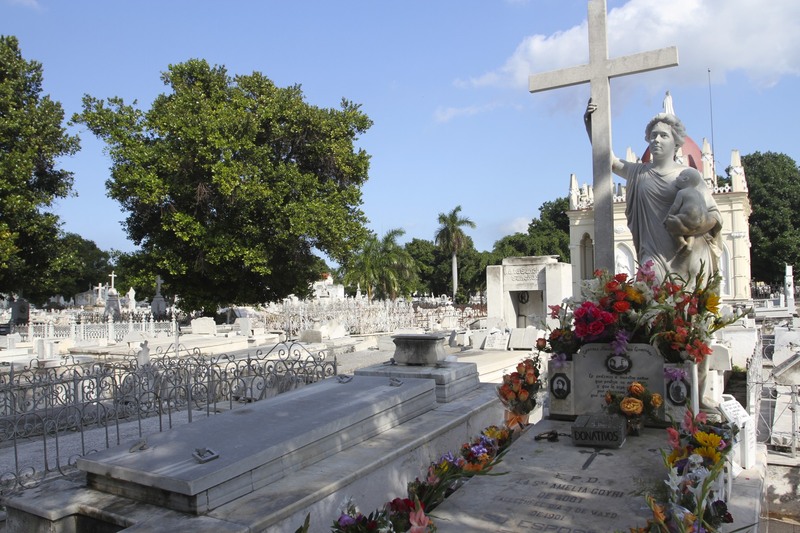 I find cemeteries fascinating, and I’ve visited an unhealthy number in my travels, so I can say with some confidence that Cementerio de Cristóbal Colón is one of the finest on the planet. 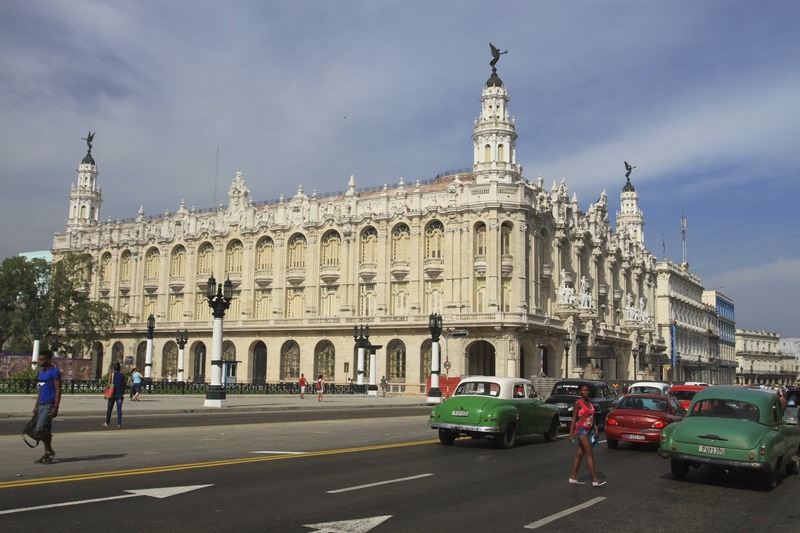 A reflection of the wealth of Cuba’s past and the grandeur of the well-heeled Vadado area of the city where it’s located. 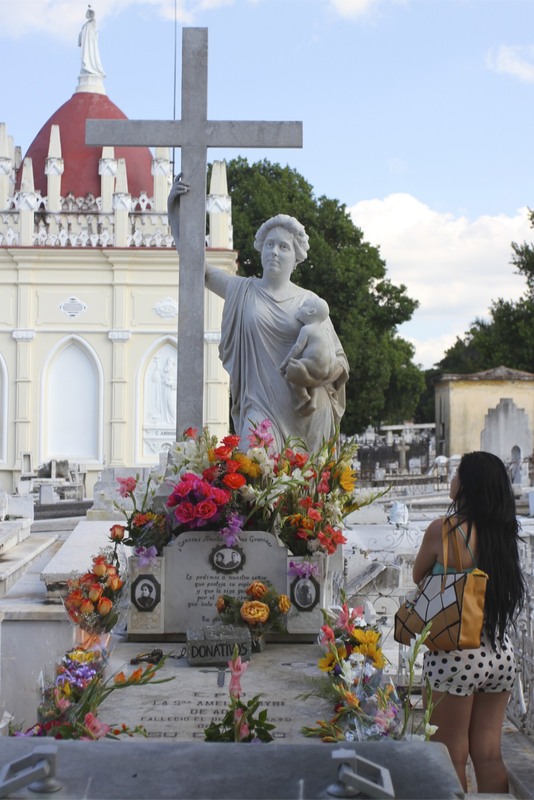 Catholic cemeteries in Latin America are frequently home to legends, those who have died (often in horrible circumstances) but who perform miracles from beyond the grave. 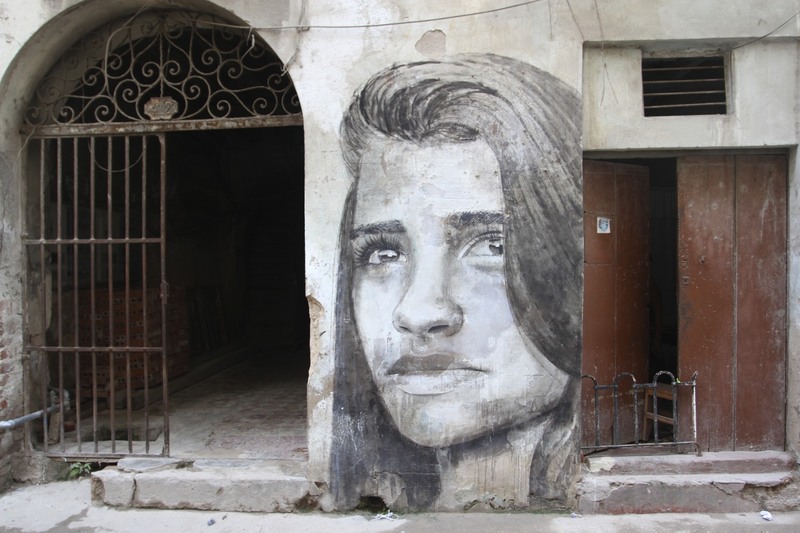 In our old home of Sucre, Bolivia, there was a woman called Margarita who was murdered and decapitated by her husband. 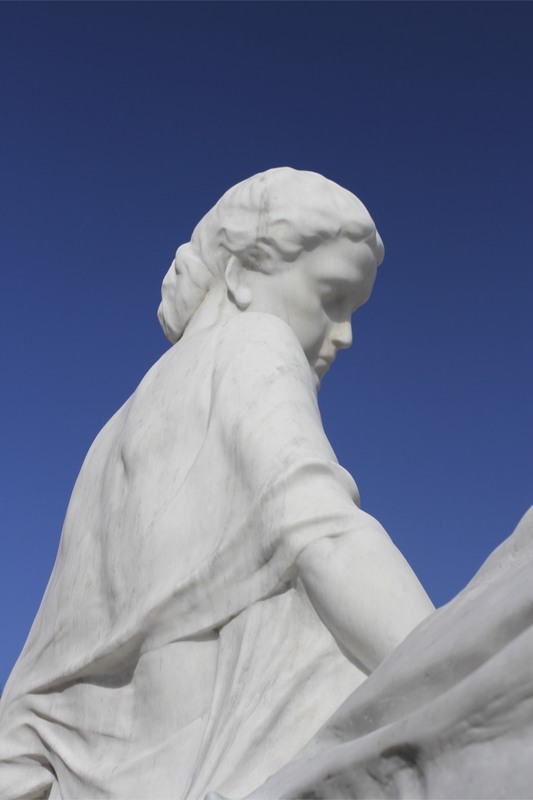 Once buried, word got around that she was performing miracles and the faithful visited her grave to ask favours. 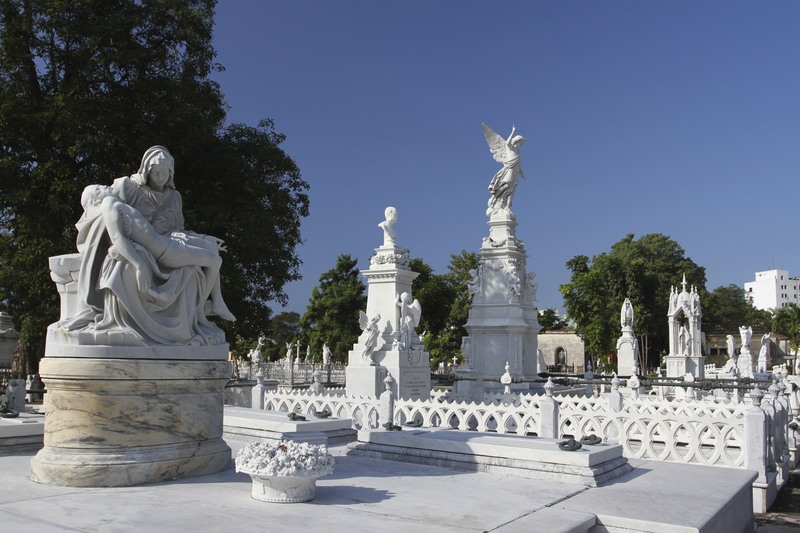 In the Cementerio de Cristóbal Colón the legend of La Milagrosa brings a steady stream of the desperate to the grave of Amelia Goyri, who died in childbirth at the age of 23. 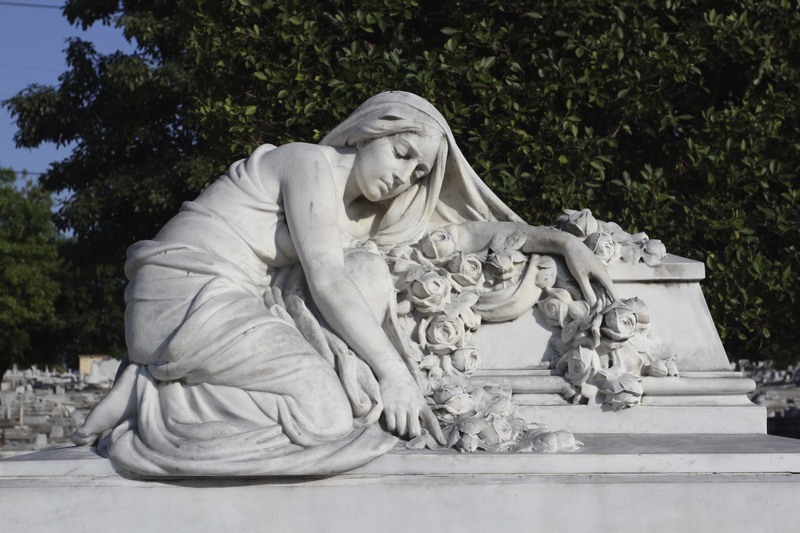 It’s said that Amelia’s husband refused to accept the death of his wife and newborn son; he visited the grave every day and knocked three times to wake them up. Rumours soon started circulating that La Milagrosa would grant wishes. 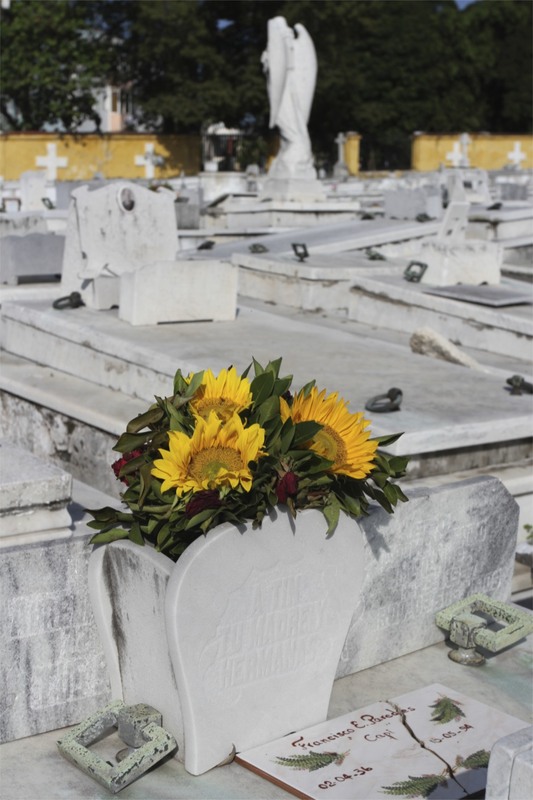 Today, mainly women visit the tomb to ask for protection for their children or for a healthy pregnancy, while those who cannot conceive ask for a miracle. 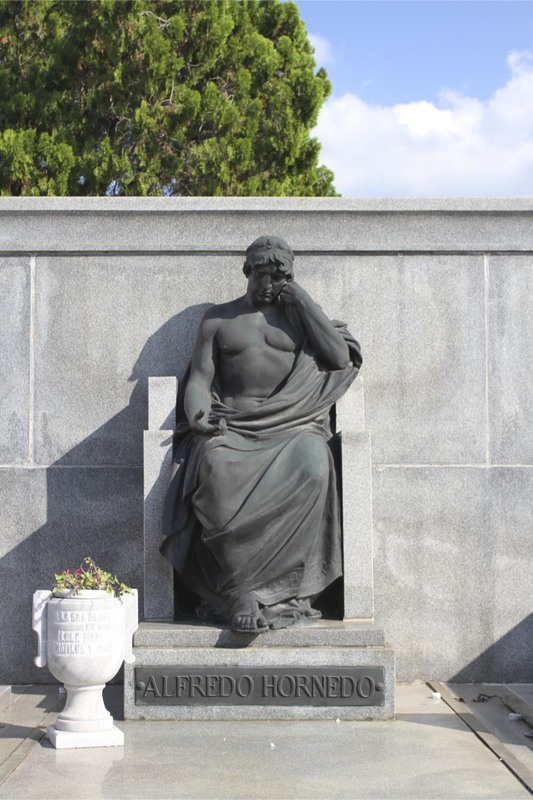 There’s a donations box on the tomb, it’s anyones guess who the money goes to but maybe it’s used to pay for the flowers that surround the grave – the only one with lots of flowers. 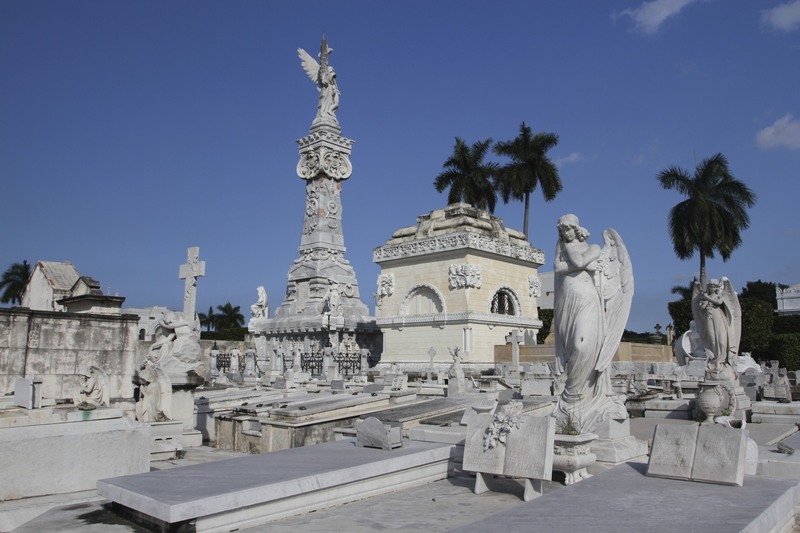 Hundreds of Cuba’s most notable citizens are buried in the cemetery: artists, writers, sculptors, musicians (including members of the Buena Vista Social Club), baseball stars, Cuban presidents and Spanish nobility can all be found here. There’s at least one world chess champion and one US Congressman. Constante Ribalaigua, drinking buddy of Earnest Hemingway and inventor of the daiquiri, is also here. 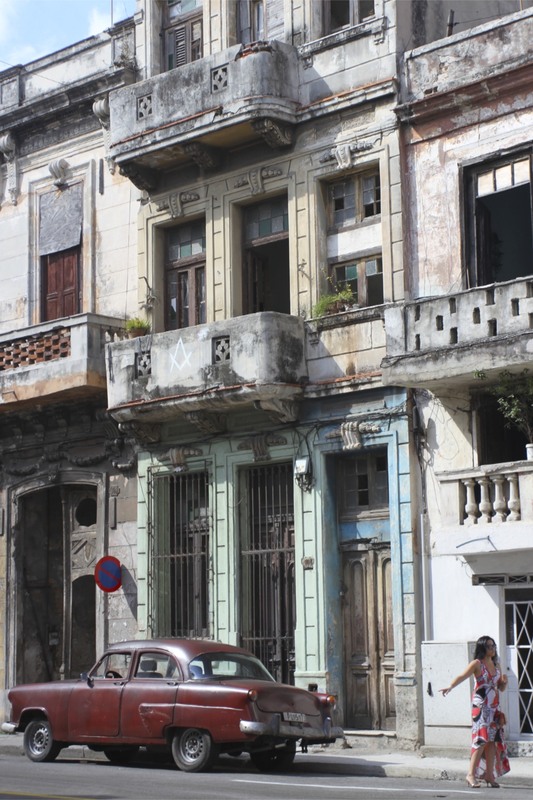 Eduardo Chibas, a Cuban politician and anti corruption campaigner who famously committed suicide during a live radio broadcast in 1951, resides here. 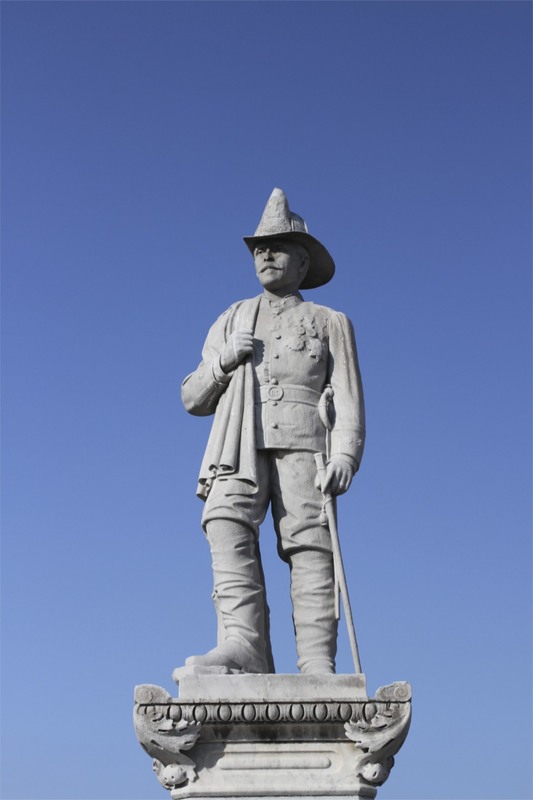 This act of defiance might have been forgotten but for a startling event at his funeral. 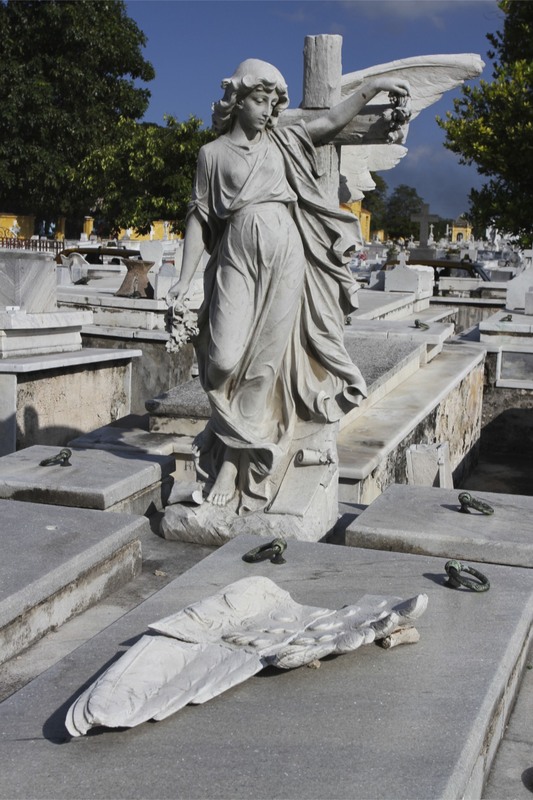 As he was buried, a young Fidel Castro leapt onto his grave to denounce the government. It was an early public appearance for the future leader of the Revolution. 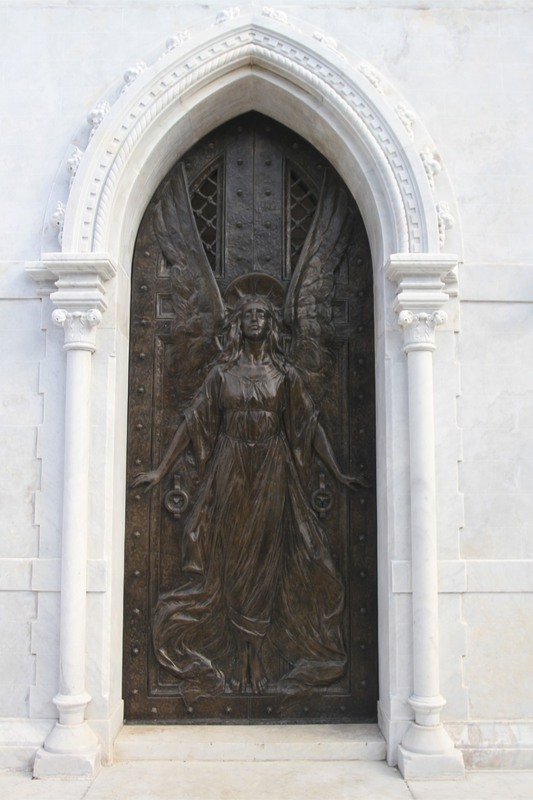 Catalina Laso, reputedly the most beautiful woman in 1930s Cuba, is buried here in a massive mausoleum. Already married, she fell in love with another man and they were forced to flee to Paris for 20 years before finally returning. 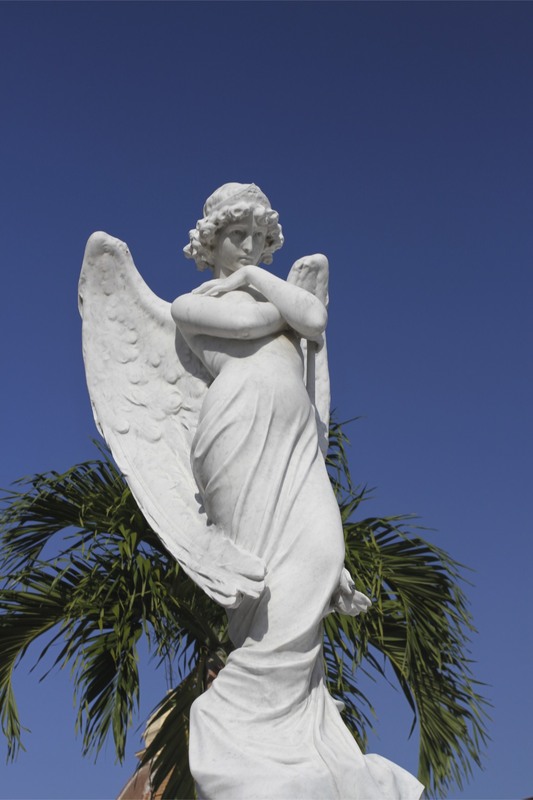 When she died her husband had Catalina embalmed and came to visit her every day. 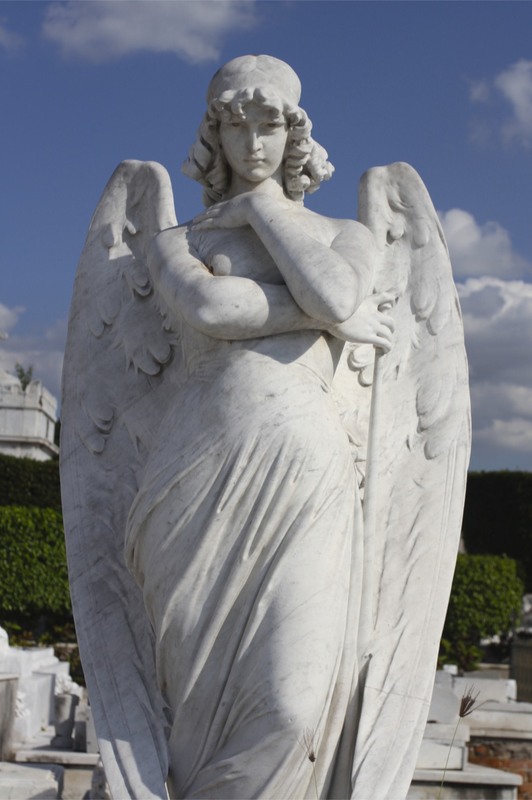 Apparently, he was buried standing next to her, from where he could gaze upon her for all eternity. There are quite a lot of communal graves for societies of firefighters, sailors, the Asturian Society, dockworkers and brewery workers. 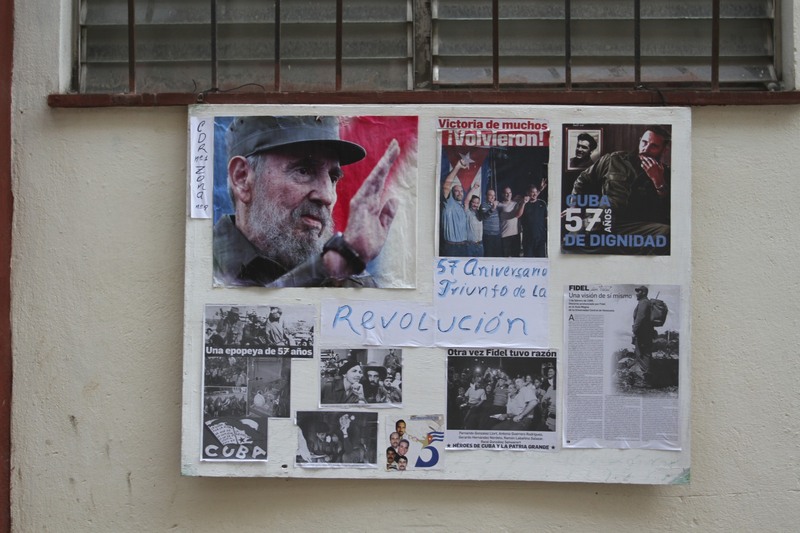 There is a communal mausoleum for Veterans of the Revolution. There is even a communal grave of the American Legion, where US soldiers who died in the 1898 war against Spain are buried. Intriguingly, one of three plaques on that memorial is dedicated to the Confederacy. 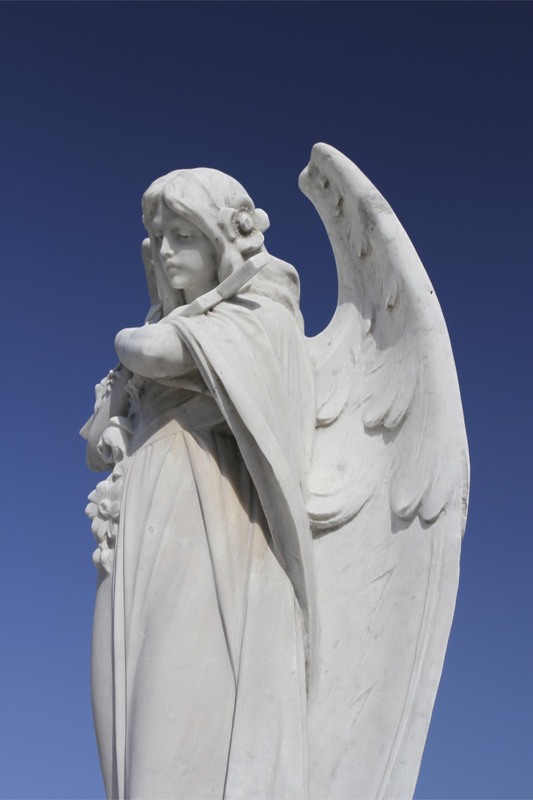 The cemetery is full of stories like these, and even fuller of wonderful architecture. It’s a tranquil place to explore and I could have spent hours wandering around. It was really hot though and not everyone in our group (of two) is as keen on cemeteries as me. 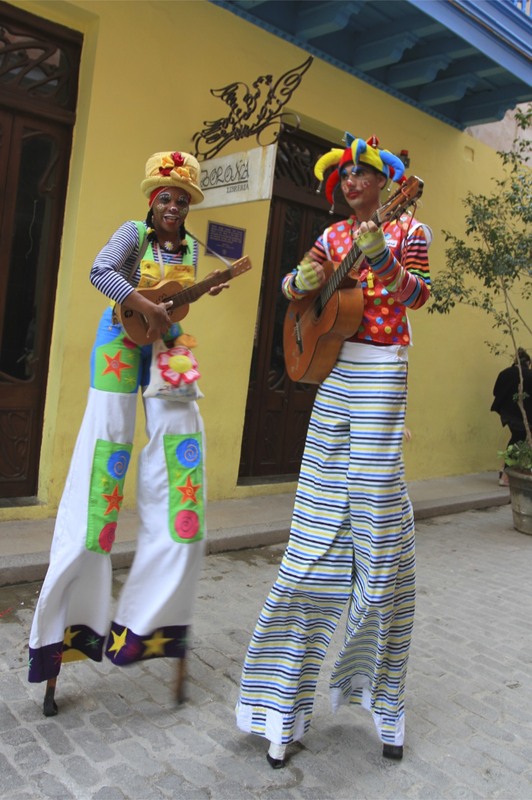 We left the dead behind and headed off to find a cooling daiquiri to honour Constante Ribalaigua. 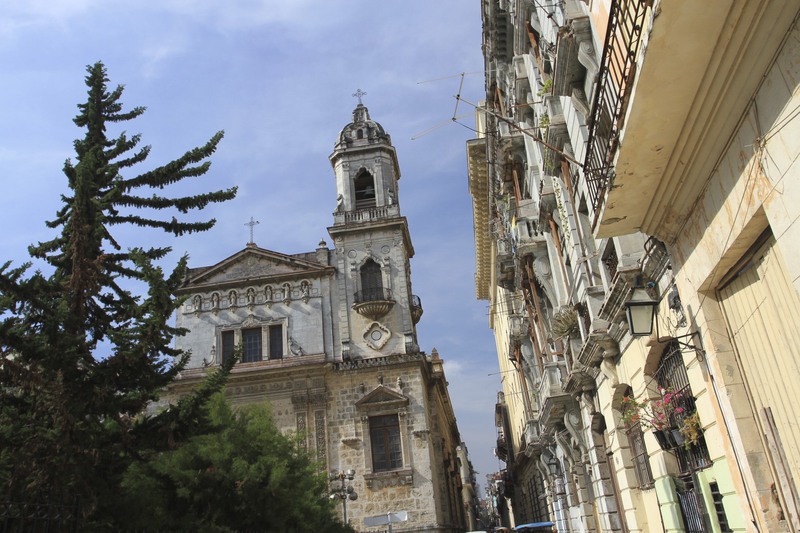 Havana’s extraordinary history is reflected in the crumbling grandeur of Havana Vieja, the city’s Old Town. 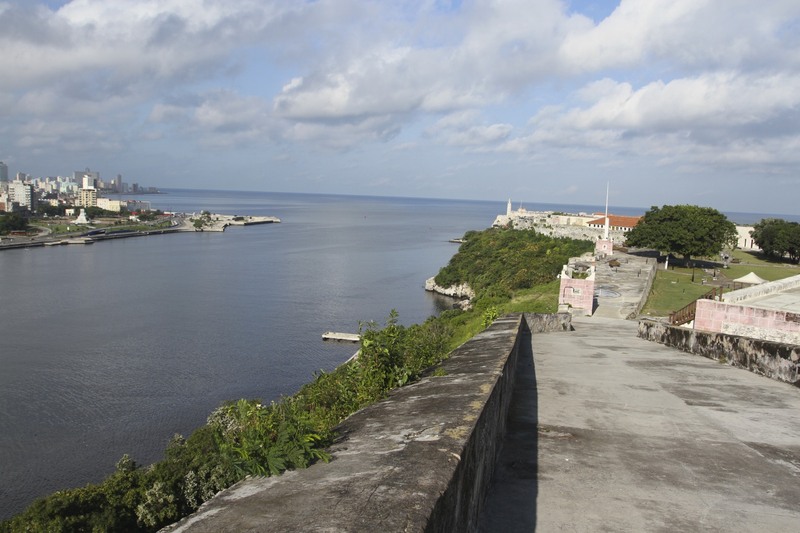 The current city was founded in 1519, making it one of the oldest European cities in the Americas. 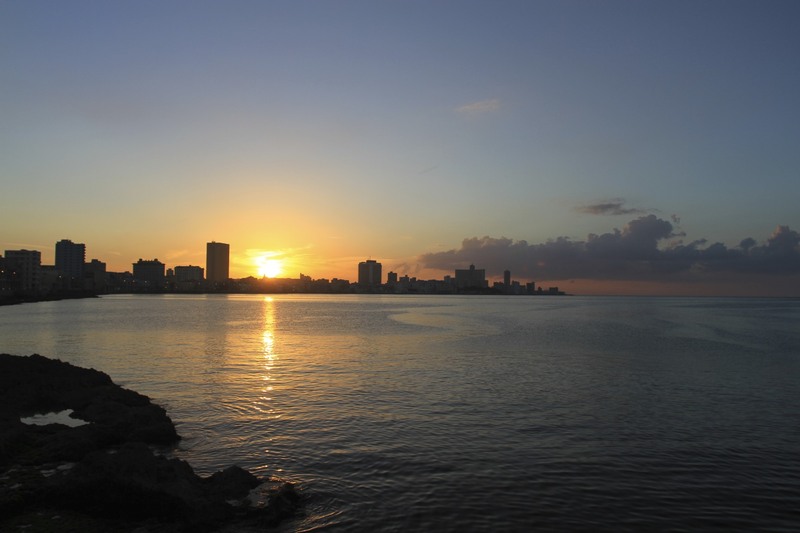 Two earlier attempts saw the city relocated twice before being built on the deep natural harbour of La Habana Bay. Seen from the air, the sweep of the bay is majestic. 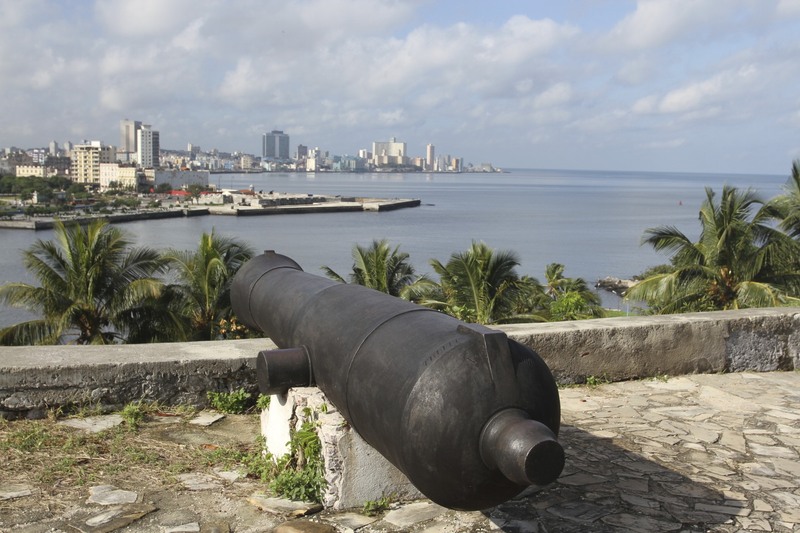 As the Spanish conquest of the Americas gathered pace, and vast shipments of gold and silver began to make their way back to Madrid, Havana’s location on the Atlantic Ocean at the mouth of the Gulf of Mexico made it the most important port in Spain’s empire. 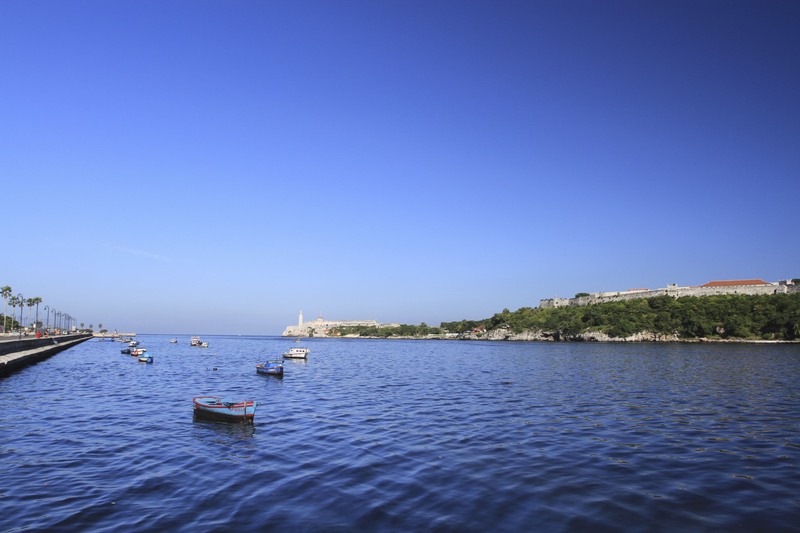 Treasure ships would gather in Havana before running the pirate gauntlet when sailing to Europe. 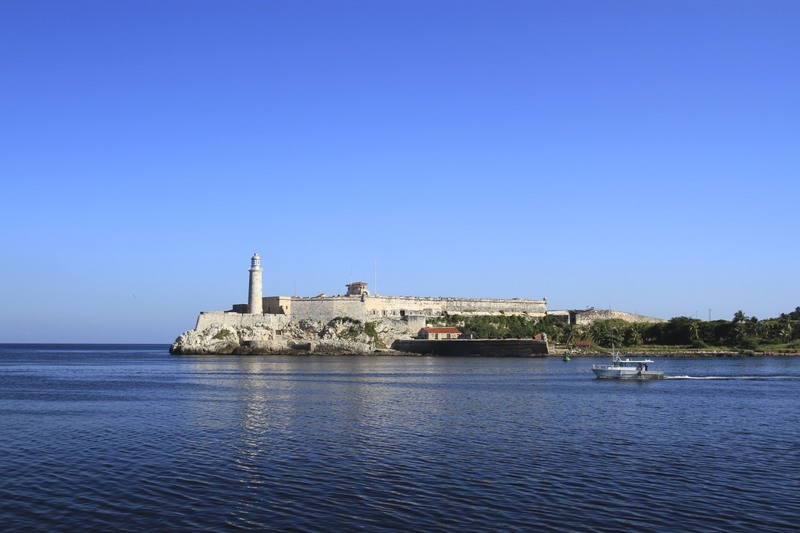 Throughout the city you can see massive fortifications built to protect Havana and, over the entrance to the harbour, are the impressive fortifications of Castillo de los Tres Reyes Magos del Morro and Fortaleza de San Carlos de la Cabaña. 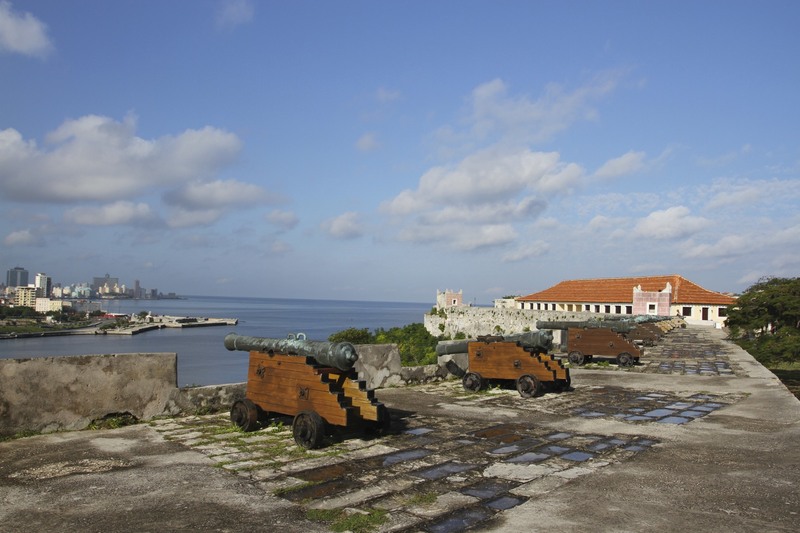 These kept pirates at bay but didn’t stop the British capturing Havana in 1762 (swapped for Spanish-controlled Florida a year later). 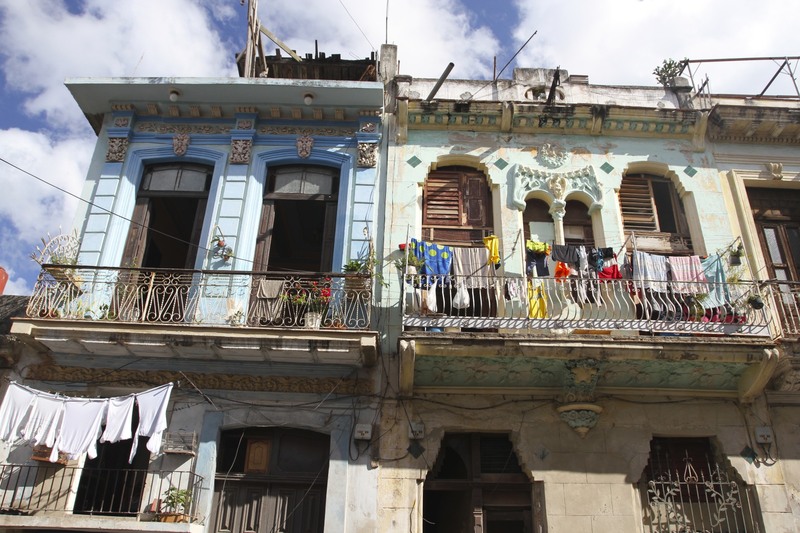 Everywhere we went in Havana was fascinating, whether the dilapidated but fiercely energetic Havana Centro where we stayed, or the more upmarket and ‘middle-class’ Vedado. 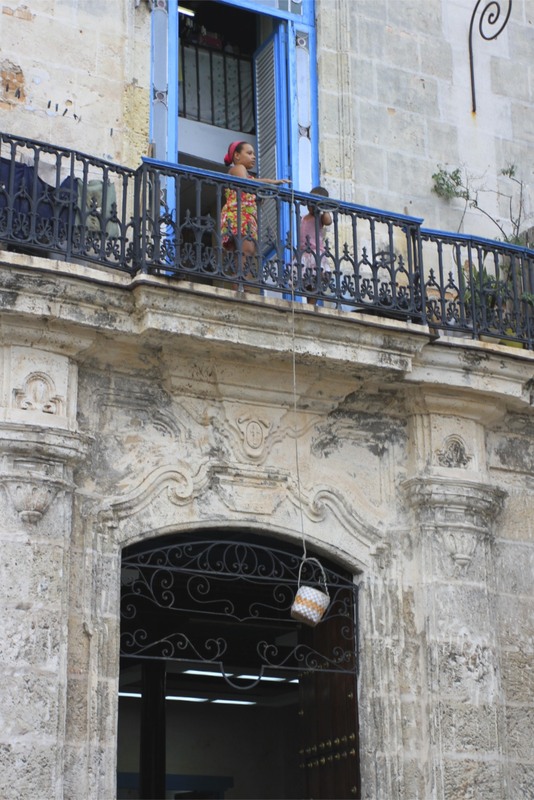 But Havana’s Vieja area is special. 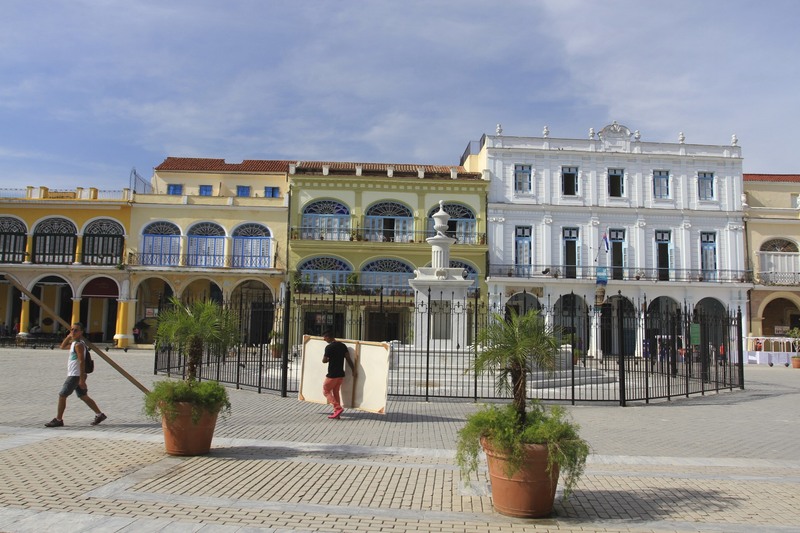 Renovations to parts of the 16th Century heart of Cuba’s enigmatic capital, have returned some of the city’s most historic buildings to their former glory. 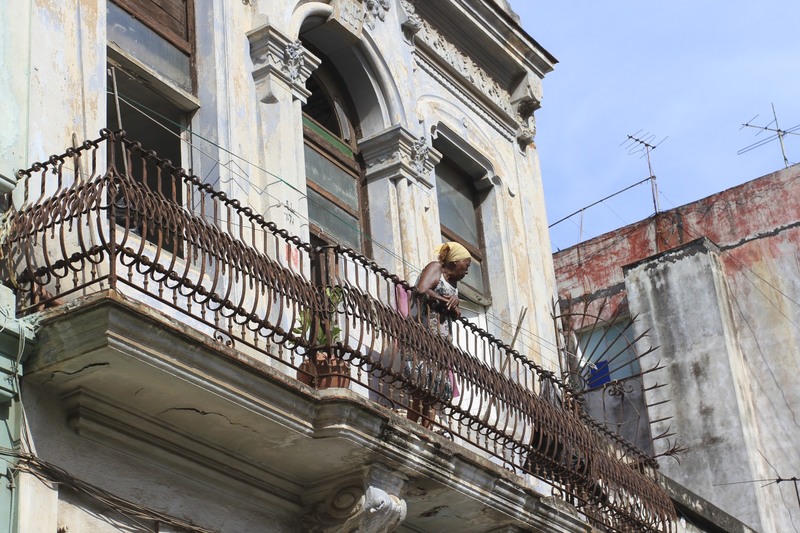 This has been a labour of love for Havana’s official historian who oversees restoration efforts – especially given the shortage of cash for such a massive undertaking. 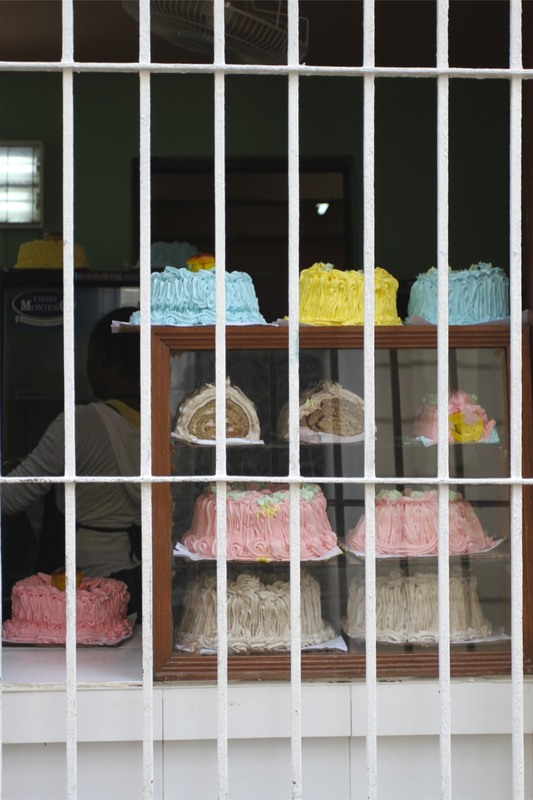 The result really did remind me of Cartagena in Colombia. 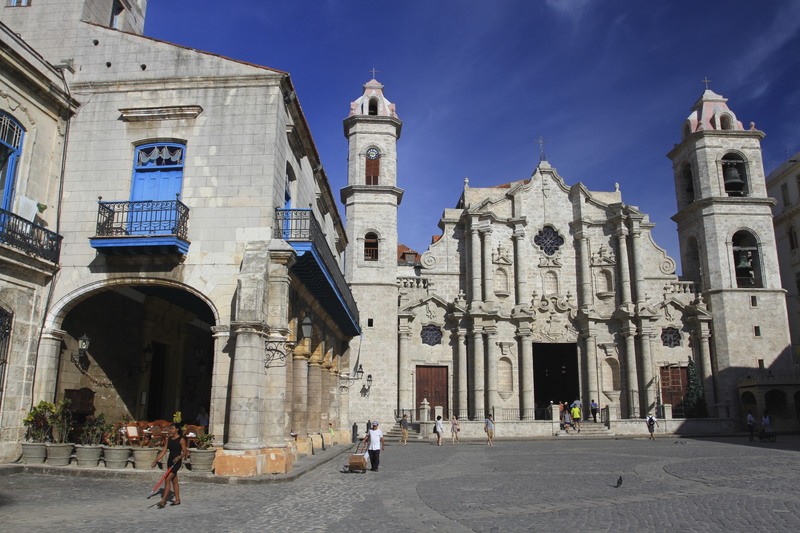 The four main plazas in Havana Vieja are surrounded by magnificent Spanish colonial buildings, and linked by busy streets crammed with ornate houses with iron balconies, boutique hotels, shops and restaurants with tables on the streets. 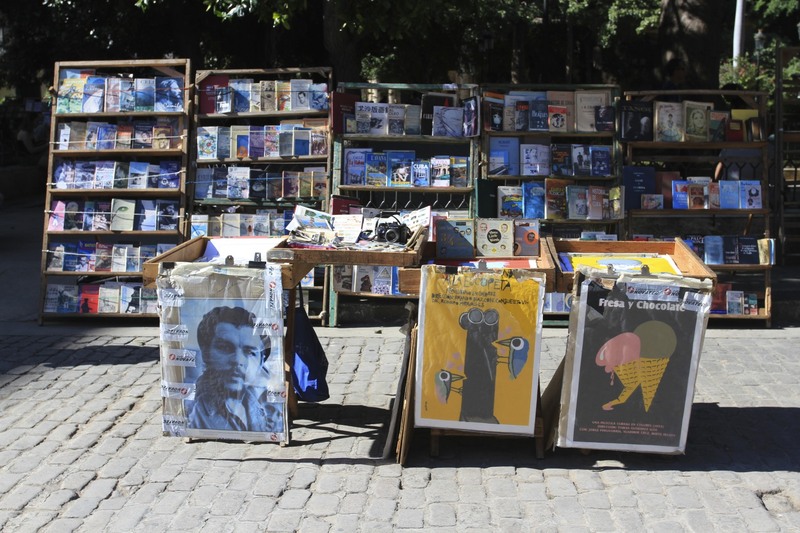 It’s a compact area of tightly packed streets that can easily absorb several days of wandering without ever feeling you’ve seen it all. Timeless scenes are played out day-and-night in these fascinating streets. 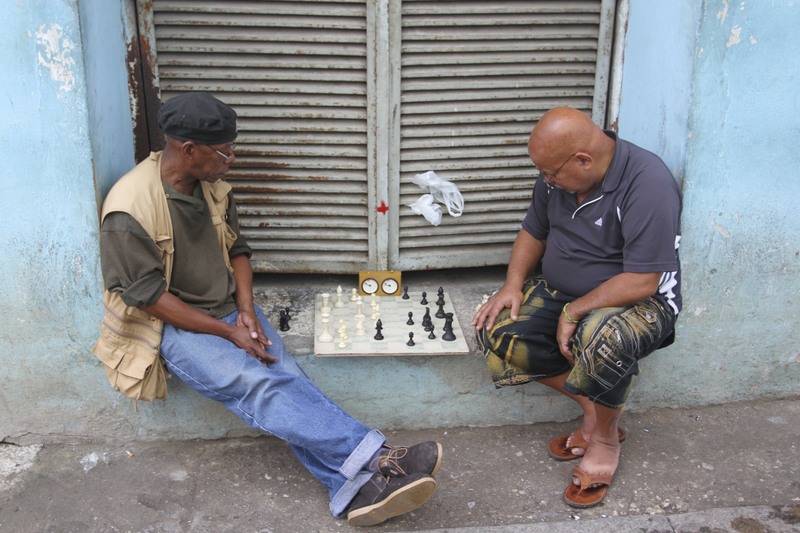 Neighbours chatting, fruit and vegetable carts on street corners, hole-in-the-wall rum shops, pan duro y pan fresco sold from bicycles, bits of pig hanging from hooks, money lowered in baskets from balconies to buy things from street vendors, chess games in doorways and domestic life glimpsed through un-shuttered windows. 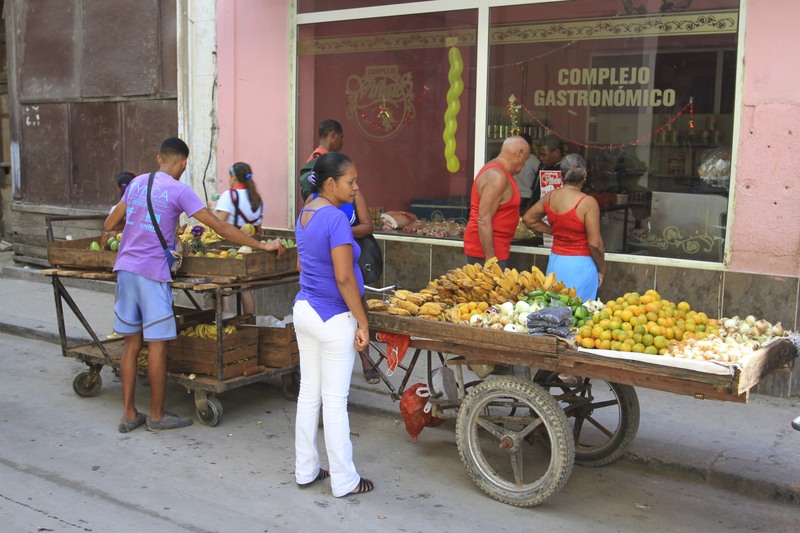 Daily life in Havana Vieja is pure theatre, the sights and sounds of the streets are a delight to experience. 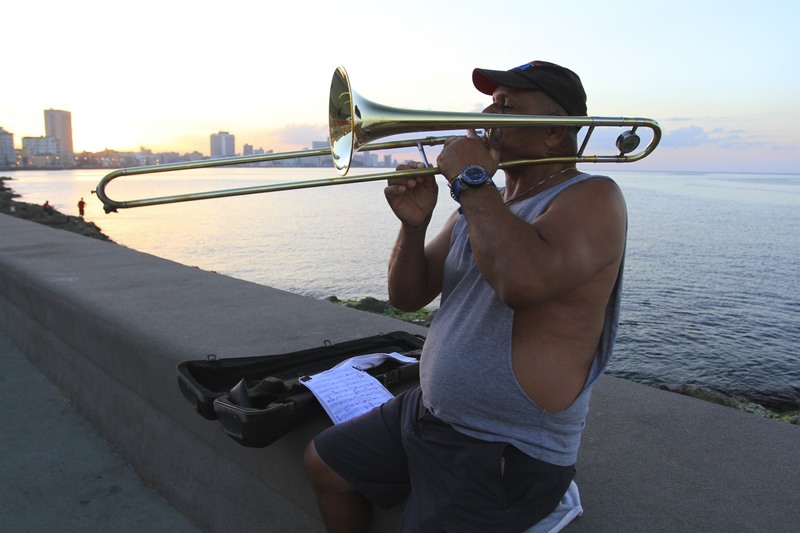 More than its history, more than its architecture, this is what makes Havana special and makes people fall in love with the city. 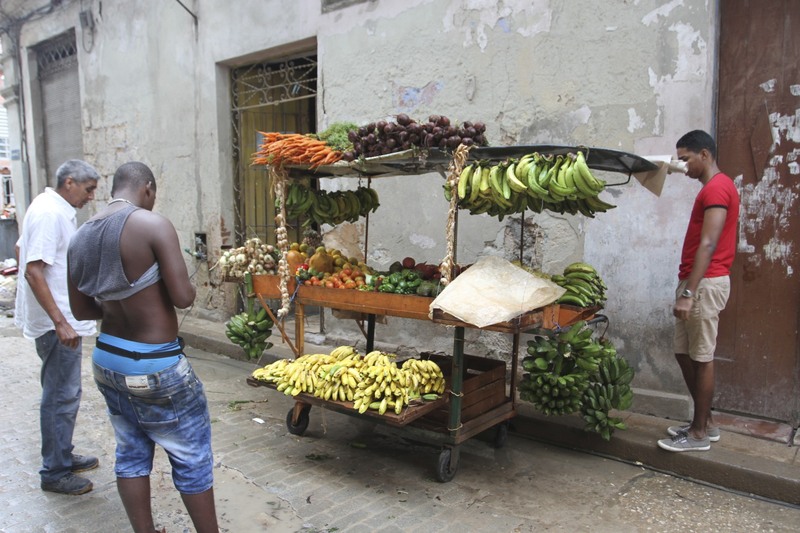 It’s this way of life that people worry is threatened by the impending influx of tourists and money; but I suspect Cubans and Cuban culture are more durable than that.